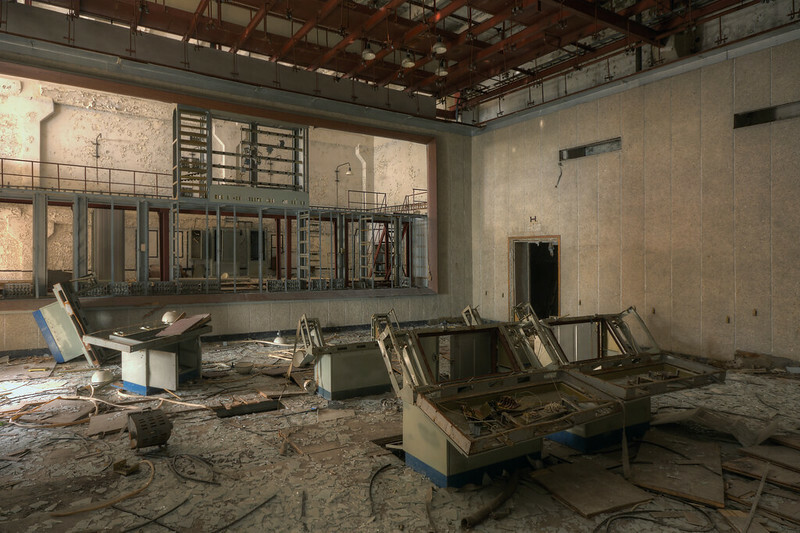 In the early hours of the morning on the 26th of April 1986, a test at the nuclear power plant in Chernobyl went horribly wrong. There was an almighty bang and big chunks of reactor number four were blown out of the top of the building. Fires raged for nine days and a radioactive cloud 400 times more toxic than the one from Hiroshima, covered a large part of the European continent. 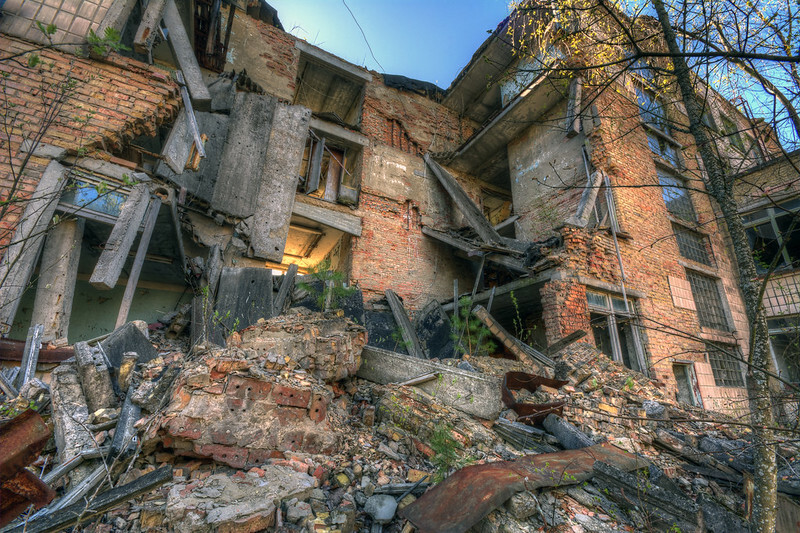 An exclusion zone of some 2600 square kilometers was established around the power plant. 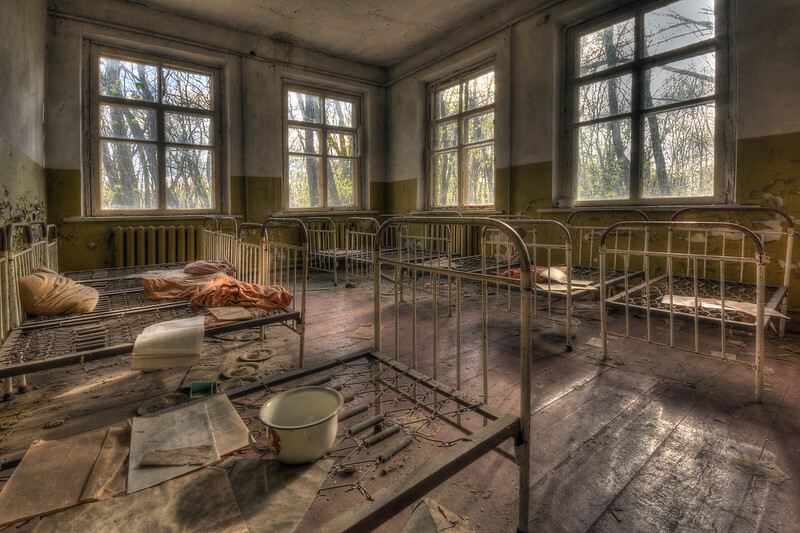 130000 people were evacuated from Chernobyl, Pripyat, and scores of towns and villages. 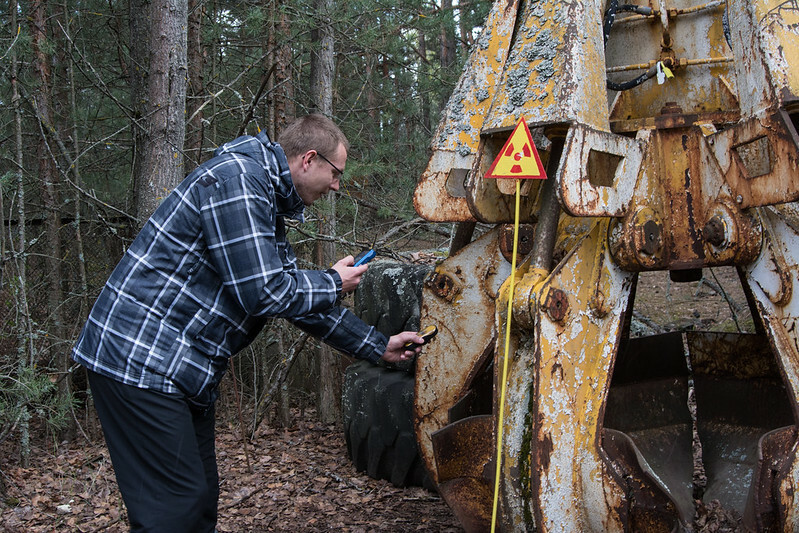 Although some parts of the exclusion zone are still very radioactive, massive cleanup efforts by the Soviet Union and subsequently the Ukrainian authorities have reduced the radioactivity in most areas to comparatively “normal” levels. 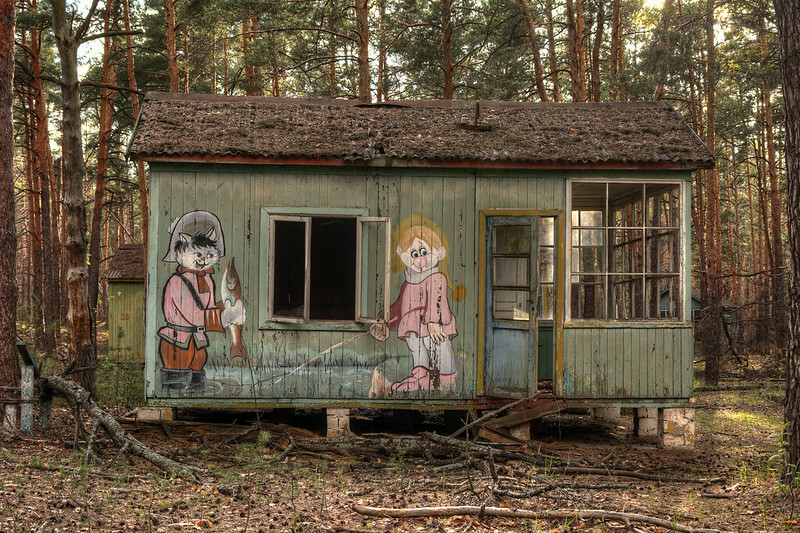 In recent years, Chernobyl has become something of a tourist destination. 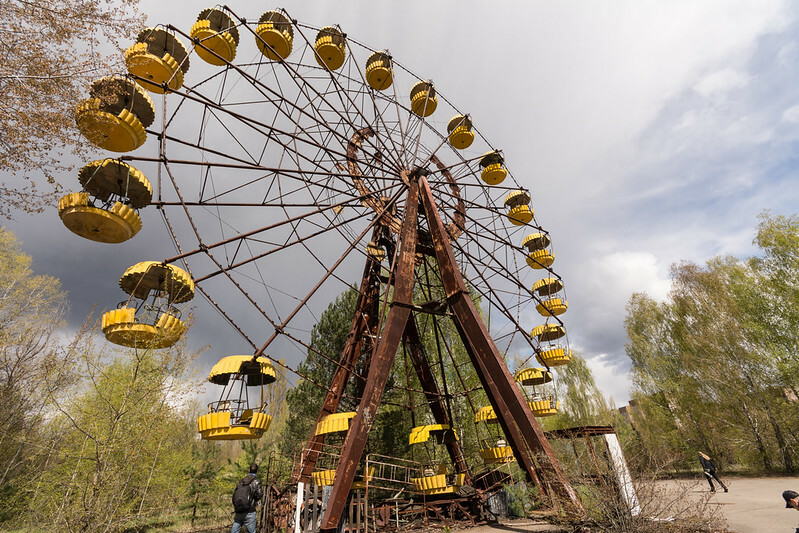 Following protracted negotiations with my wife (who I could not persuade to accompany me), I signed up for a two-day tour with Kiev based Chernobylwel.com. 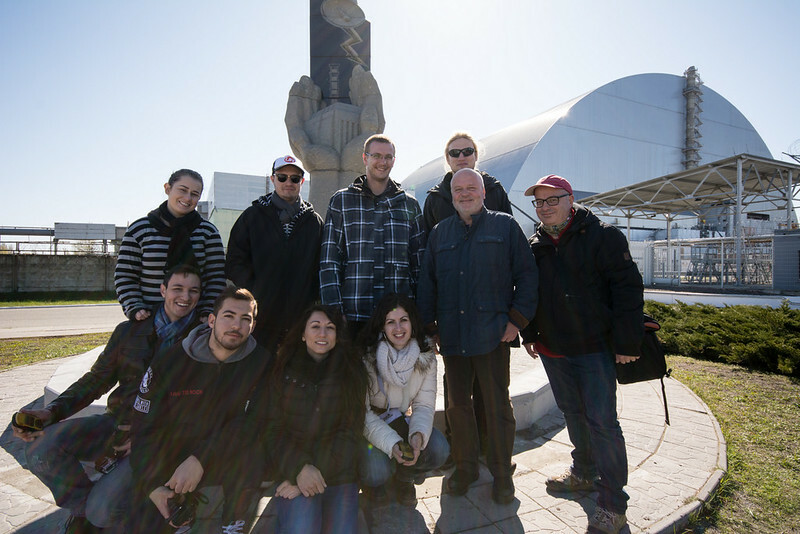 At 8:00am on Sunday the 23rd of April 2017, I joined up with 11 like-minded souls, and our guide Serhii, outside the Kentucky Fried Chicken restaurant near Kiev’s main railway station. I was VERY excited! After a two hour minibus ride, our first stop in the zone, was the village of Zalissia. 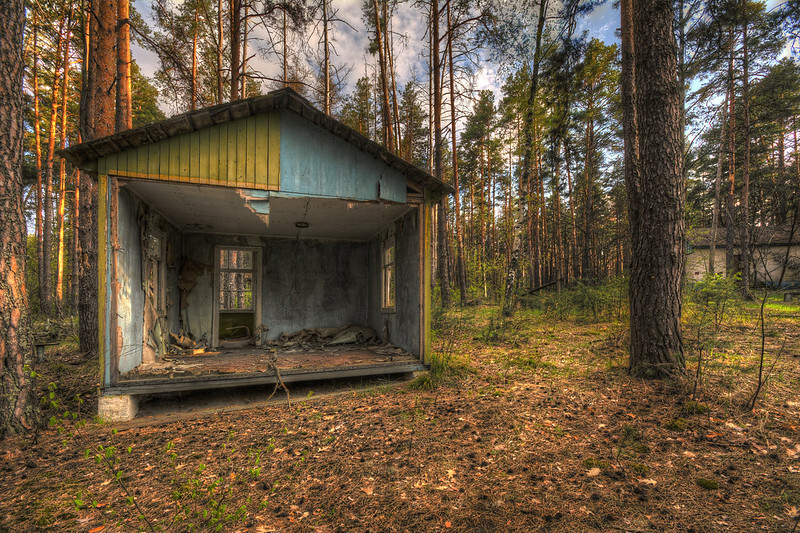 We left the main road and walked down an overgrown forest track past abandoned houses and a shop. A couple of stray dogs accompanied us. They were friendly and looked healthy enough. A quick check of my Geiger counter did not show any increase in radioactivity levels. The biggest building in the village was the “Palace of Culture”, derelict now of course but it had obviously been quite an imposing building in it’s time. 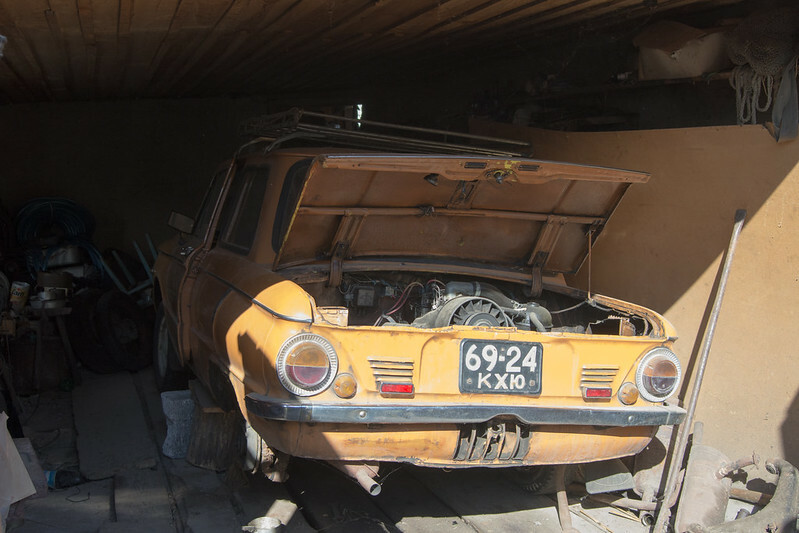 This Lada WAZ-2101 (I think) has not moved in 31 years and is unlikely to be going anywhere soon. 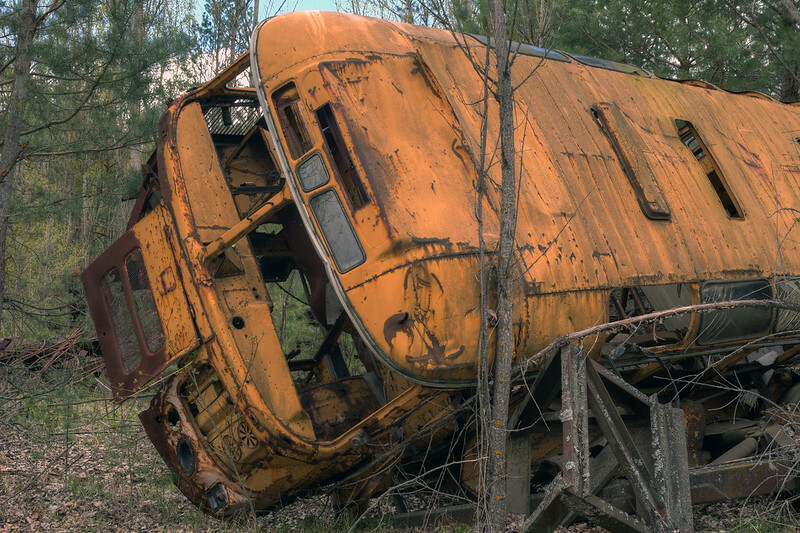 A few minutes later we were back on the minibus and heading north towards Chernobyl. 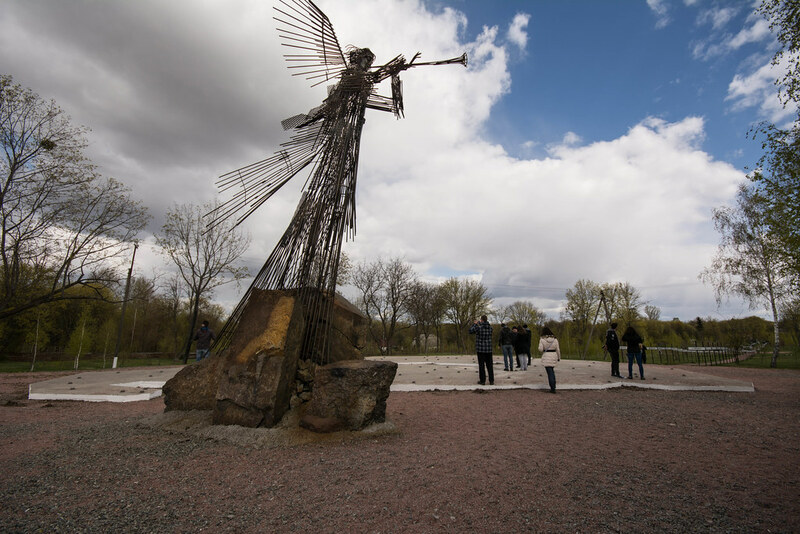 We stopped for photos at the sign on the edge of the town and then continued to the center where we stopped to admire the Wormwood Angel sculpture and the various art installations that commemorate the villages that were abandoned following the disaster. 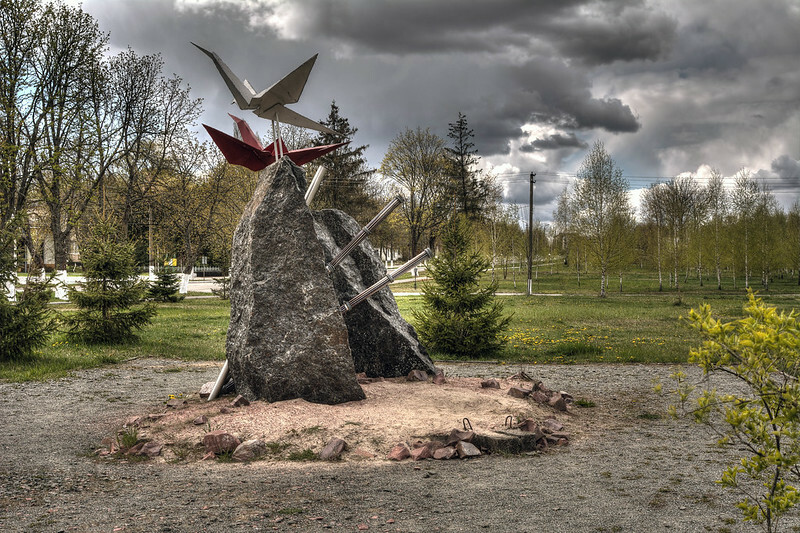 This monument was constructed by Japanese artists (hence the origami motiv). It shows fuel rod assemblies and graphite moderator blocks. There is also a Fukoshima installation and, completing the nuclear trinity, one for Hiroshima as well. 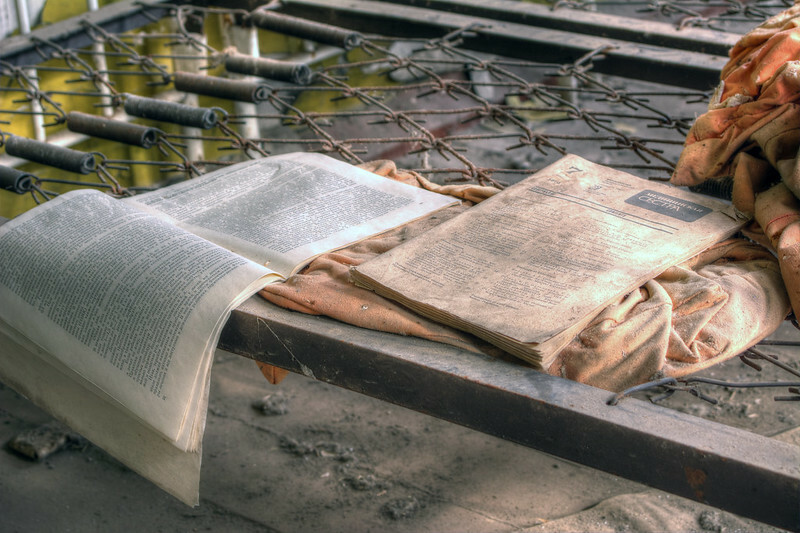 As we looked at the Angel, Serhii read a rather chilling verse from the book of Revelation, which could be interpreted as foretelling the incident at Chernobyl 2000 years before it actually happened….. 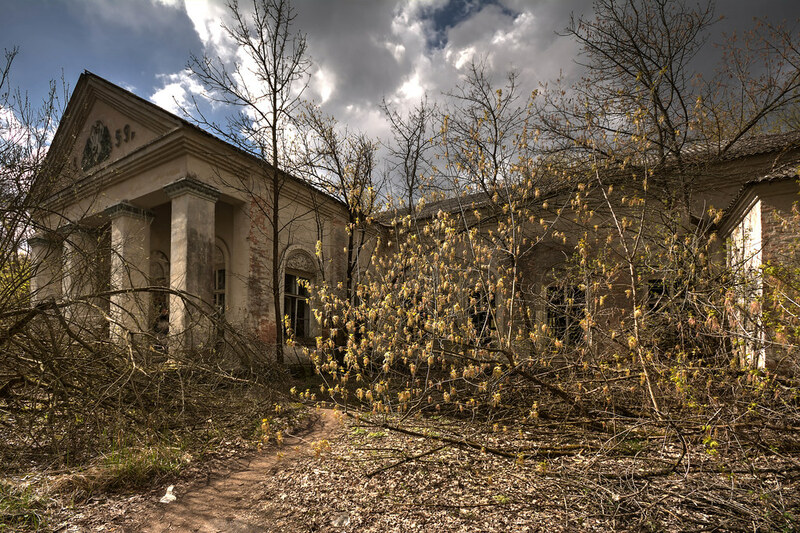 The spooky thing is that the town of Chernobyl takes its name from the wormwood bushes that thrive in the sandy local soil! 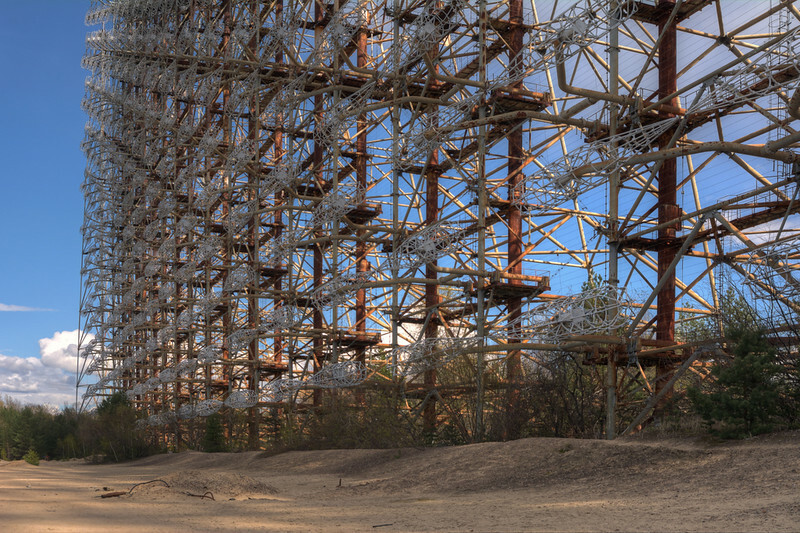 After a filling but unexciting lunch at the only tourist hotel in town (the Desiatka or Hotel Ten), we headed out to the secret military site that housed the “Duga” over the horizon radar receiver. This colossal installation, marked as a children’s summer camp on contemporary maps, was designed to receive signals that had been bounced off the ionosphere, to provide early warning of ICBM launches in the USA. 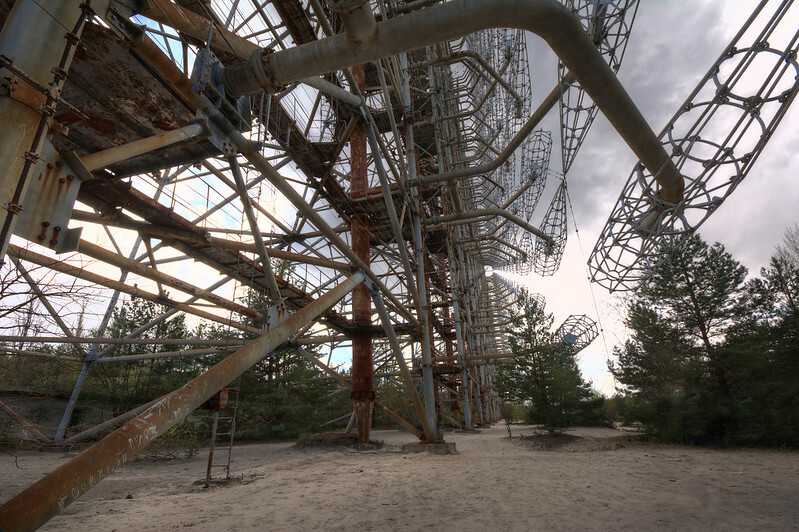 Walking along beneath the antenna arrays for a few hundred meters, we reached the command and control center where we had a little bit of time to look around and take photos. 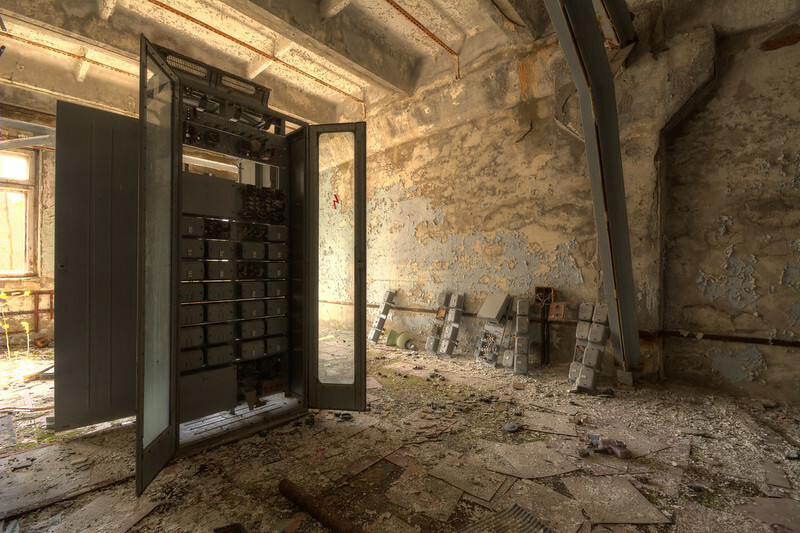 We saw vast halls filled with the empty frames of the computing equipment that was needed to interpret the signals from the antenna. 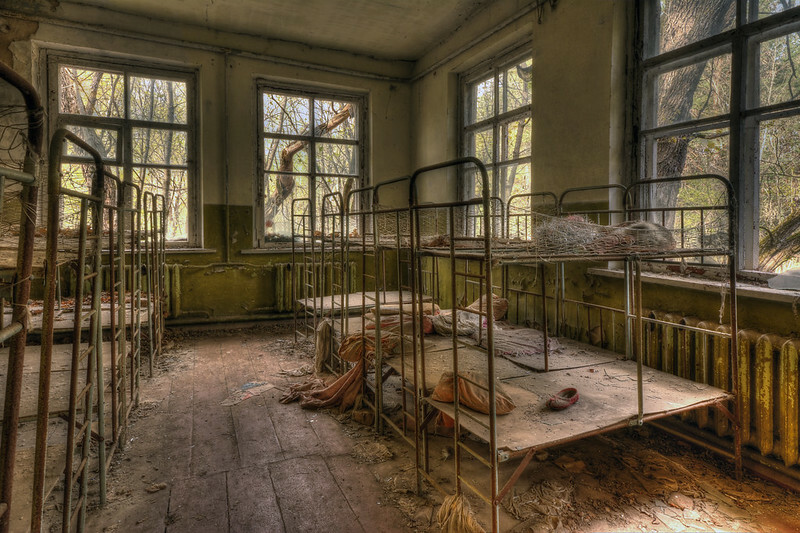 Many of the rooms were in near darkness. 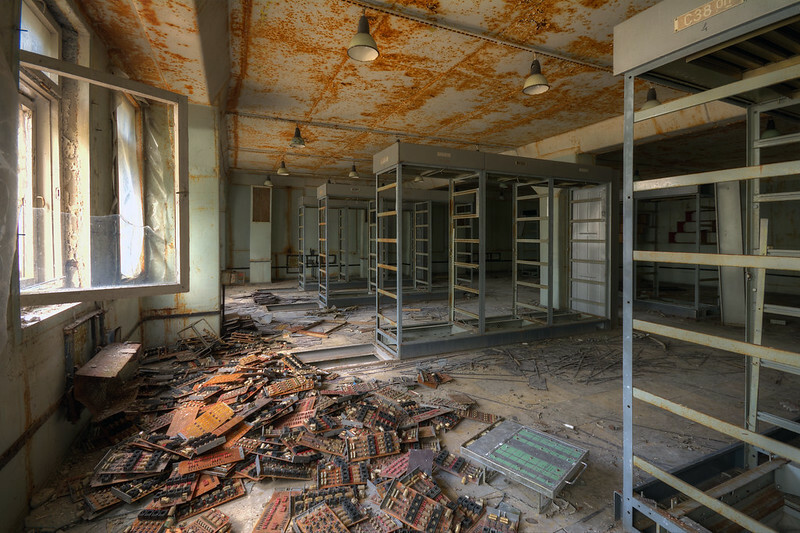 Some just contained racks of equipment but one had obviously been the control room where rows of nervous soviet intelligence officers would have once sat monitoring their screens and looking for the tell tale signs of a missile launch half a world away. 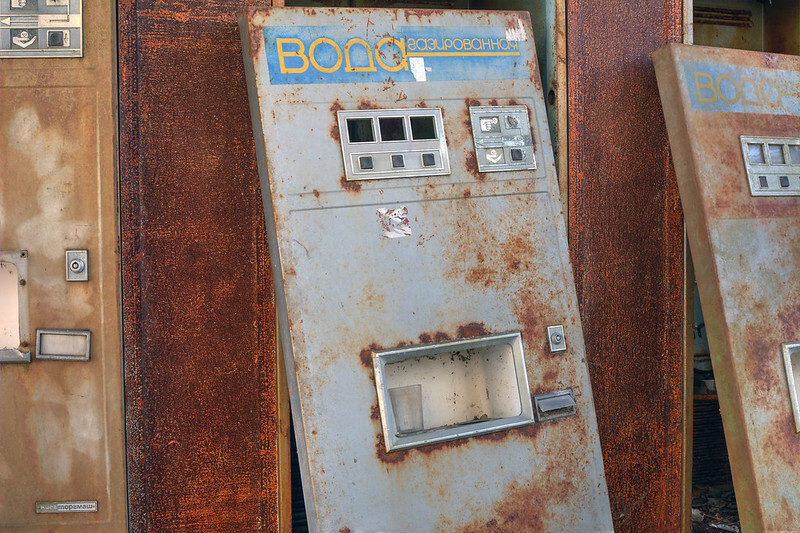 At the time of the Chernobyl disaster, the system was still in the testing phase. 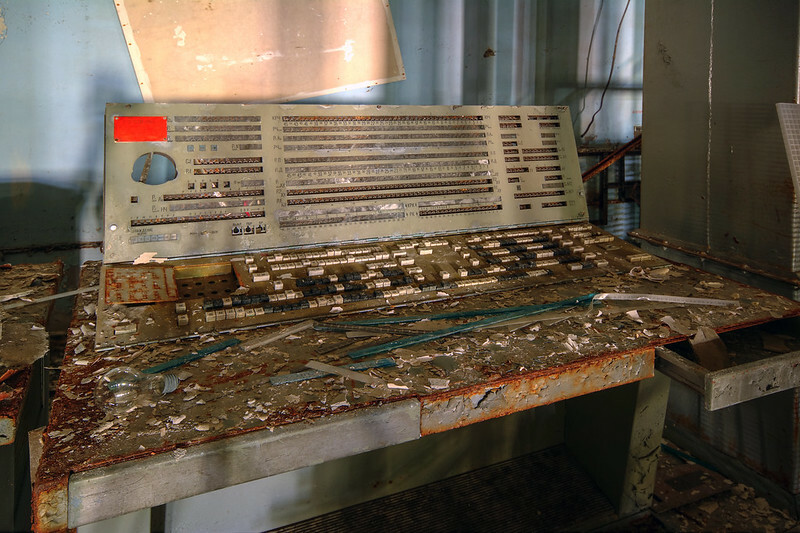 It was never fully commissioned and the project was abandoned following the explosion and meltdown of reactor number four. 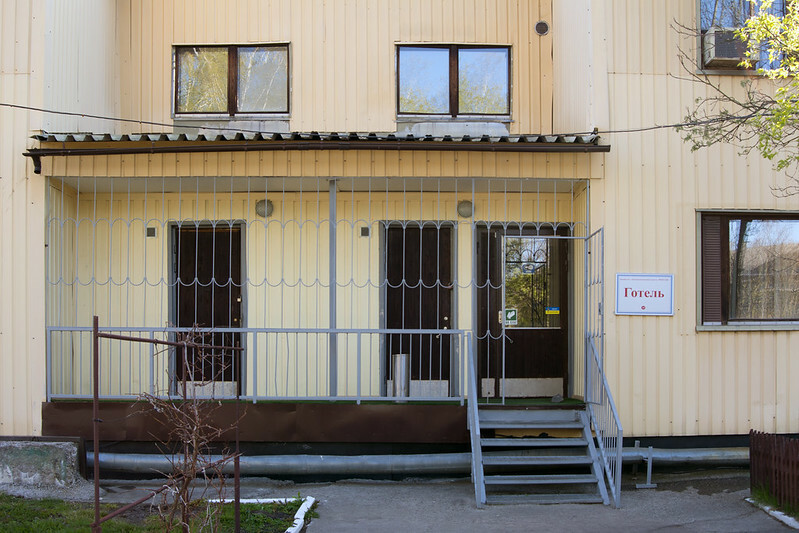 Part of the Duga site was a residential area for the families of the staff who worked at the installation. 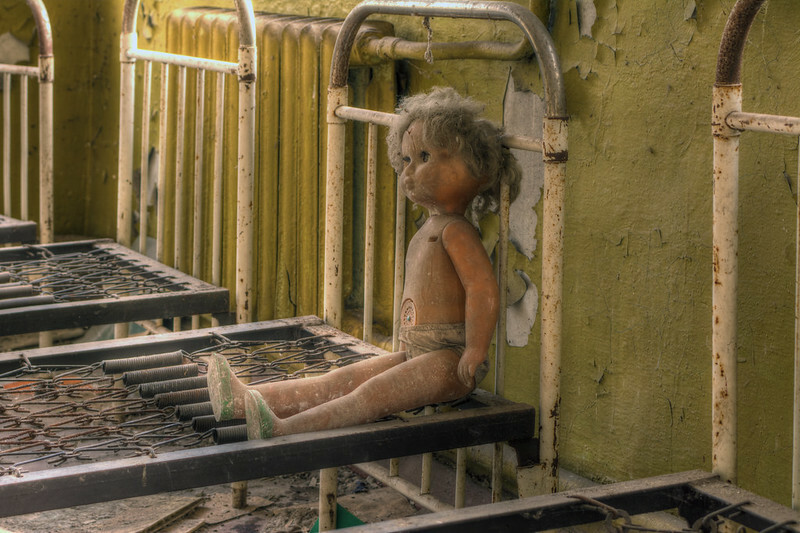 We were allowed to explore briefly one of the two, derelict apartment blocks on the site. 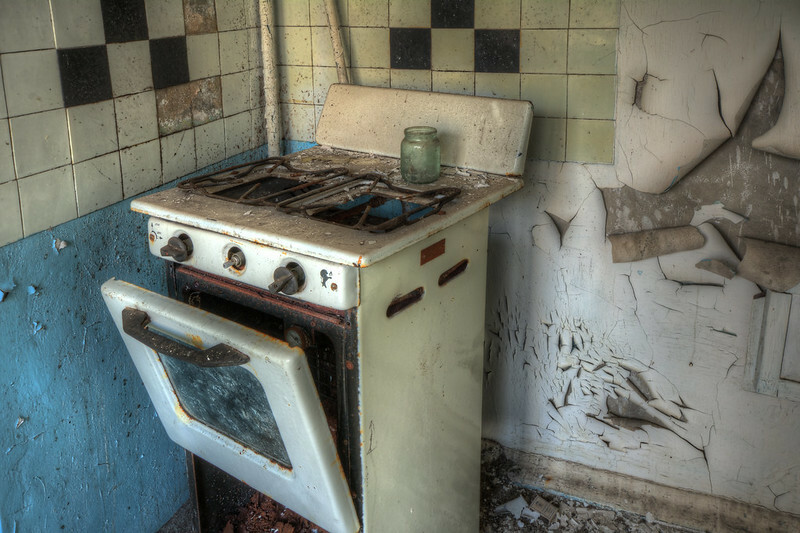 Each of the flats we looked at had more or less identical kitchen appliances and bathroom fittings. 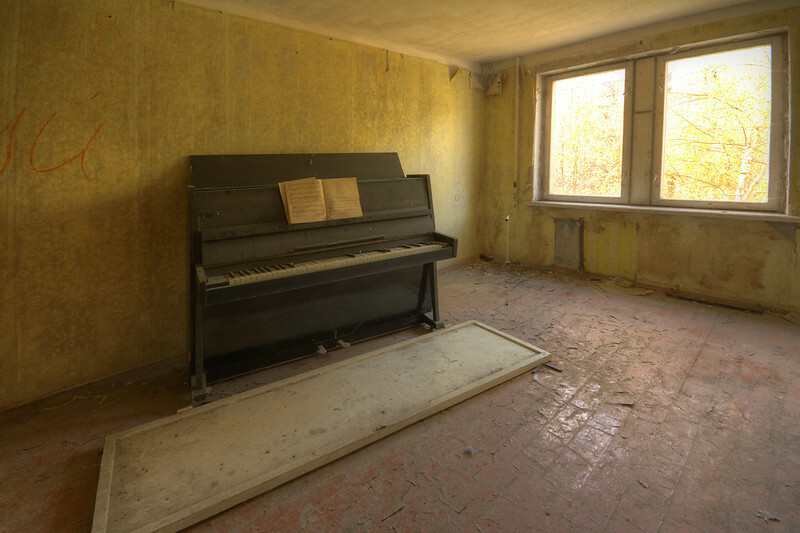 The same would probably have been true of the furniture but Serhii pointed us in the direction of one flat that had an upright piano in the living room. This must have been rather an exotic possession at the time. 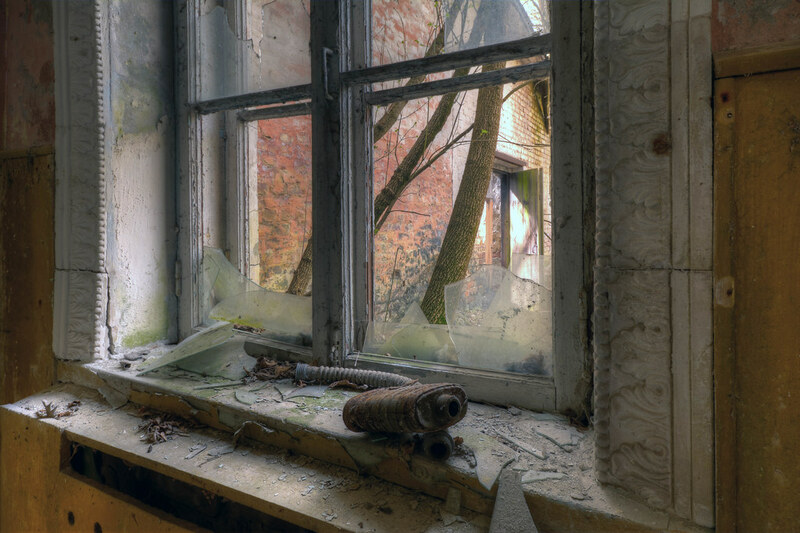 We we can only guess how popular “Liberachski” must have been with his neighbors living on the other side of the paper thin walls. 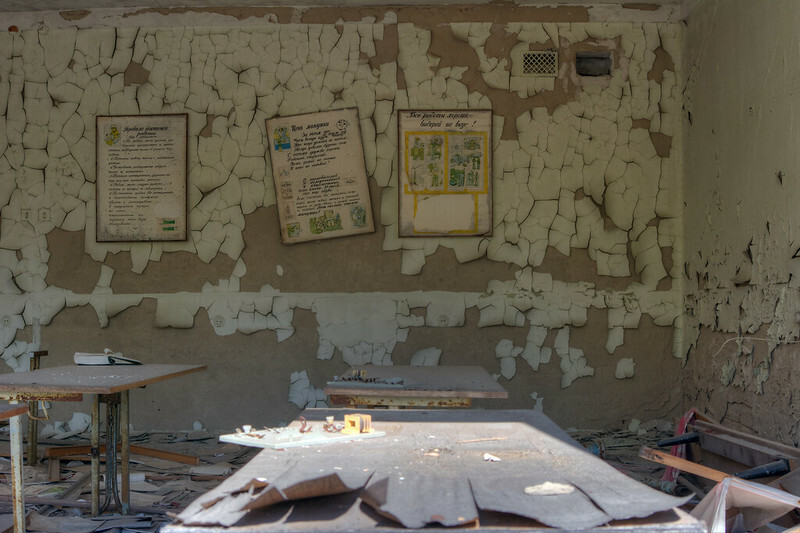 Next stop after the Duga site was the kindergarten in the village of Kopachi. 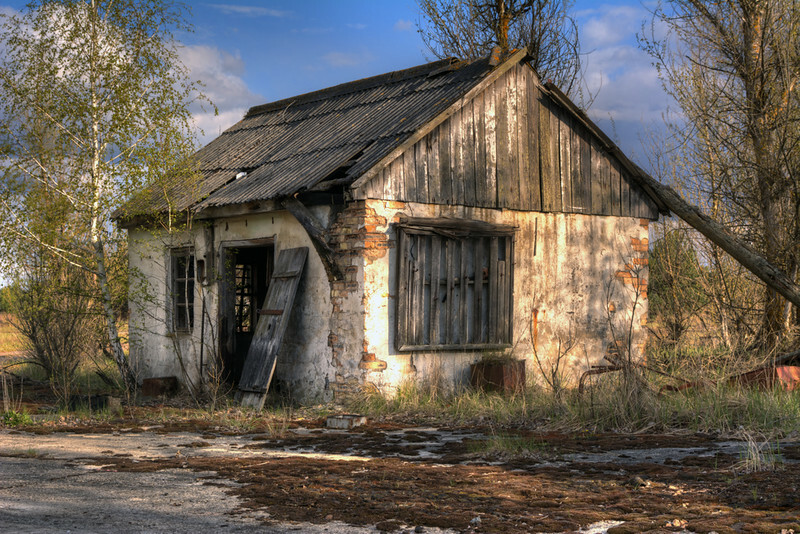 This was probably one of the more substantial buildings in the village as all of the others have been bulldozed and buried as part of the cleanup effort. There is a known hotspot close to a tree at the entrance of the building, and we all felt obliged to whip out our dosimeters and take a measurement. My geiger counter registered a maximum of 4.17 micro sieverts per hour close to the ground. 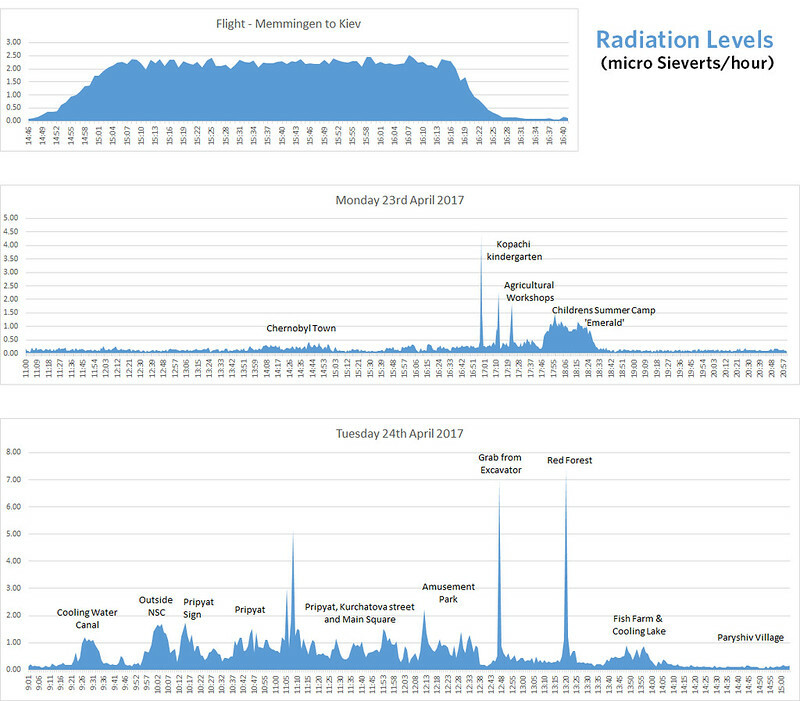 This is about twice the radiation levels that I measured at 37000 feet during my flight to the Ukraine, and well over twenty times the background level in the town of Chernobyl. Fortunately the readings dropped rapidly as we moved away from the tree. 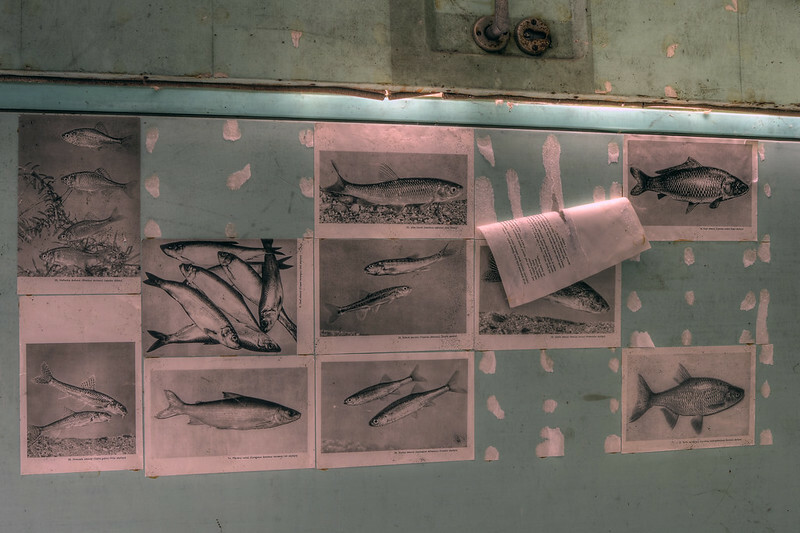 The kindergarten is a beautiful, picturesque mess. Children’s toys, books and teaching materials are strewn everywhere and, it is not difficult to get the impression that earlier visitors have arranged the artifacts into photogenic positions. Has this doll really sat in this position for 31 years? 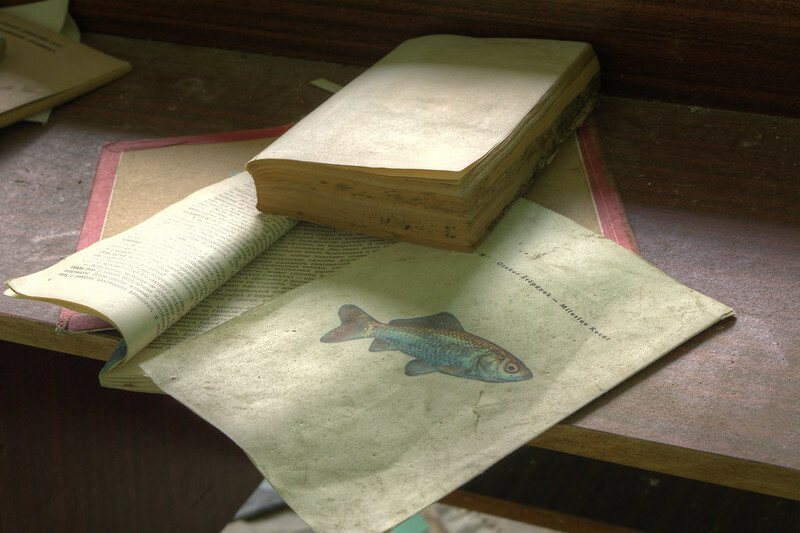 Are the books really left over from a bedtime story the evening before the catastrophe? After the kindergarten we went on a brief (and fruitless) search for wild horses that took us to some agricultural machinery workshops. 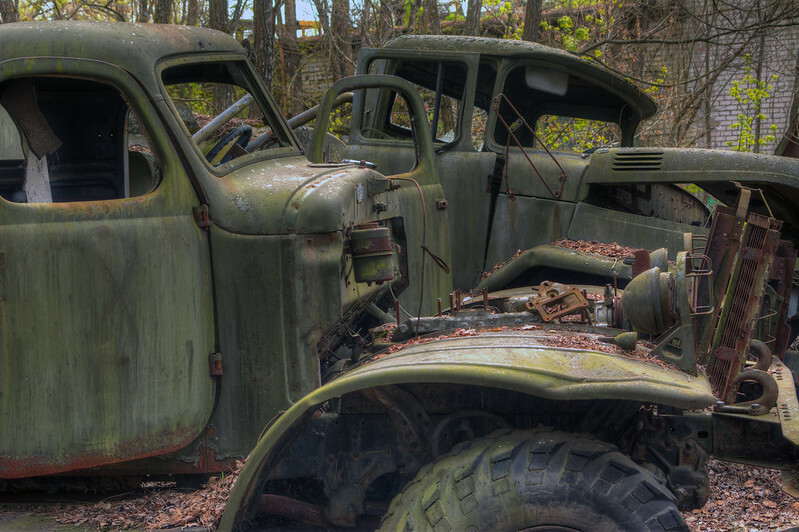 The sun was getting lower and the oblique lighting picked out the derelict buildings and vehicles beautifully. 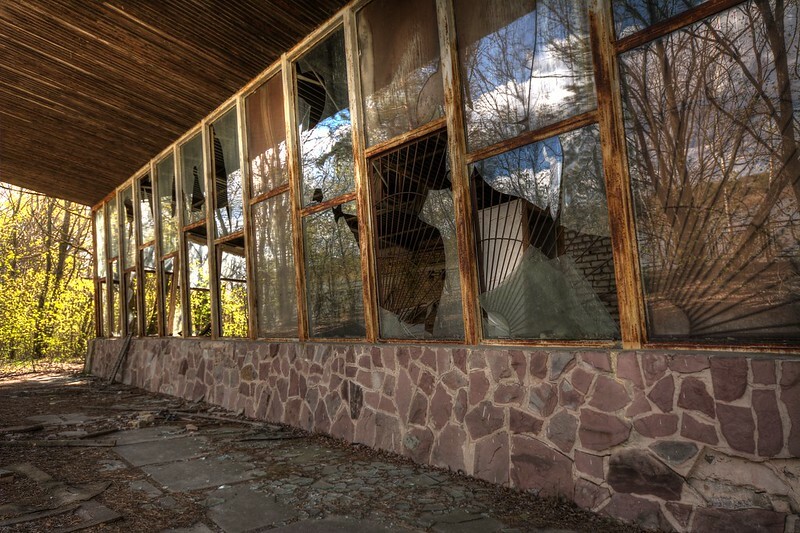 Giving up on the horses, our last stop for the day was a real Children’s Summer Camp, hidden in the woods to the south of the power plants’ giant cooling lake. 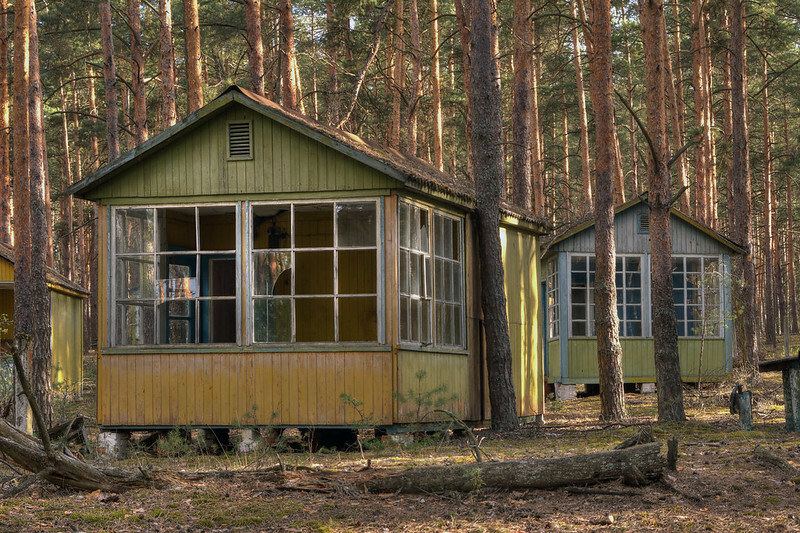 Dozens of brightly coloured chalets served as accommodation for the kids. They had a shop and an open air cinema. 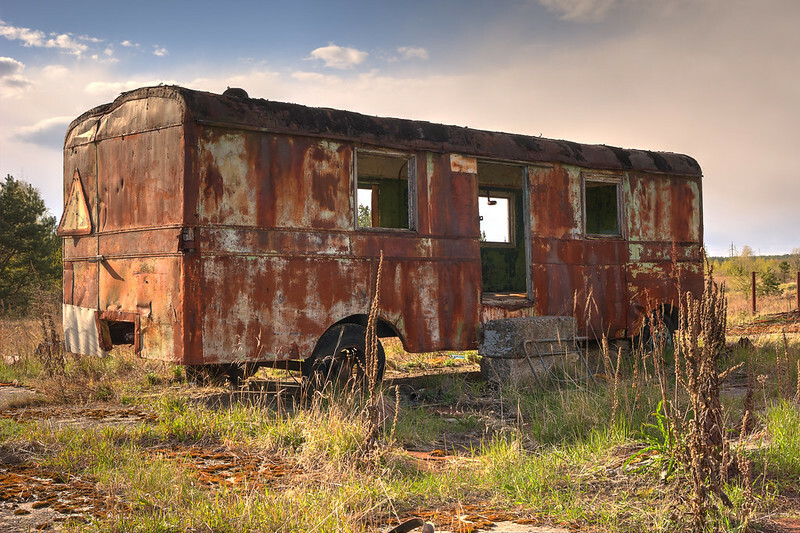 This place must have been an absolute paradise for the young pioneers of the 1970s & 80s. 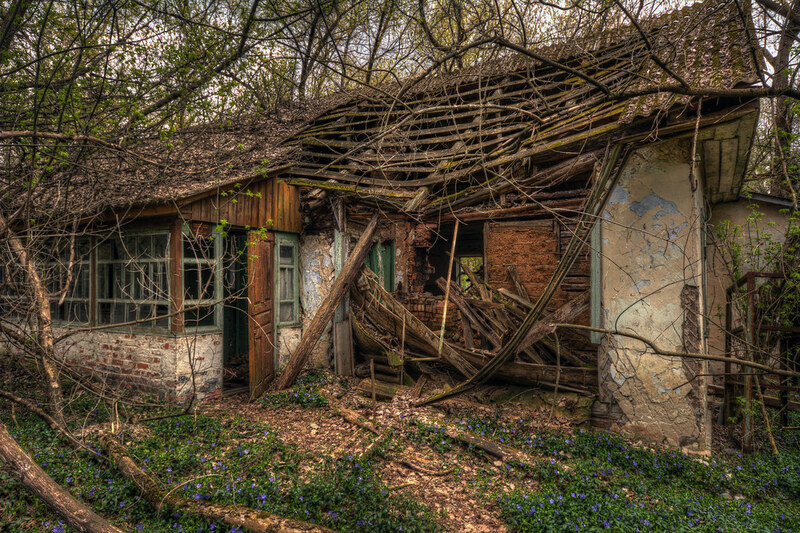 Now the place is silent and still, and the wooden buildings are falling apart. The area is still somewhat contaminated and my meter showed a bit more than 1 micro Sieverts per hour. 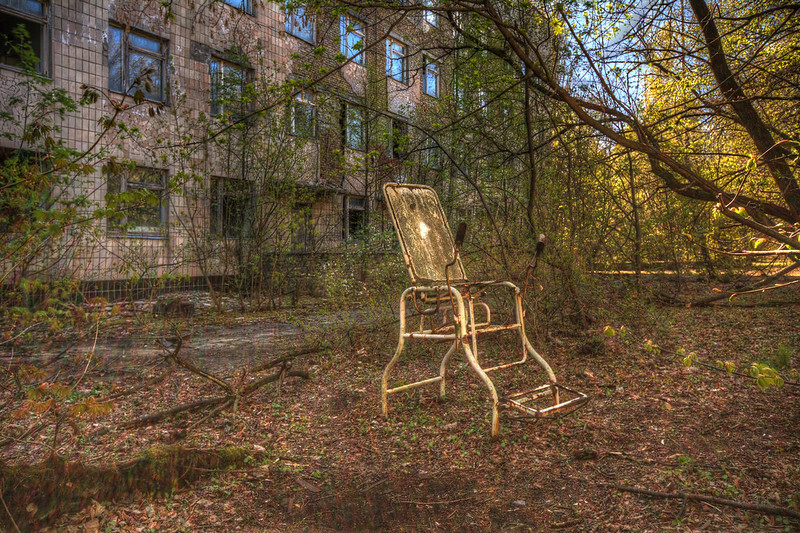 Back in Chernobyl, at the Hotel Desiatka, we had a surprisingly tolerable cabbage based dinner, and spent most of the evening loitering in the lobby (the only area with reliable wi-fi) posting our adventures on facebook and boasting to sceptical family and friends about what a great time we were having. There was a curfew after 22:00 but until then we were allowed to leave the hotel on the strict understanding that we would not go far. I walked across to one of the two shops in town to examine their modest supplies of nail clippers, processed meats, toilet paper etc. 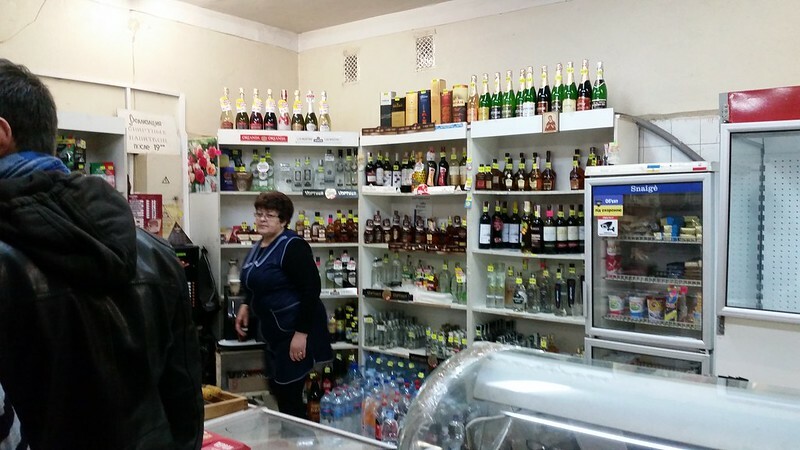 For a ghost town, they did offer an astonishing variety of alcoholic drinks. Bright and early the following morning on a deserted stretch of road en-route to the power station, our driver suddenly slammed on his brakes and called for everyone to get out of the minibus. 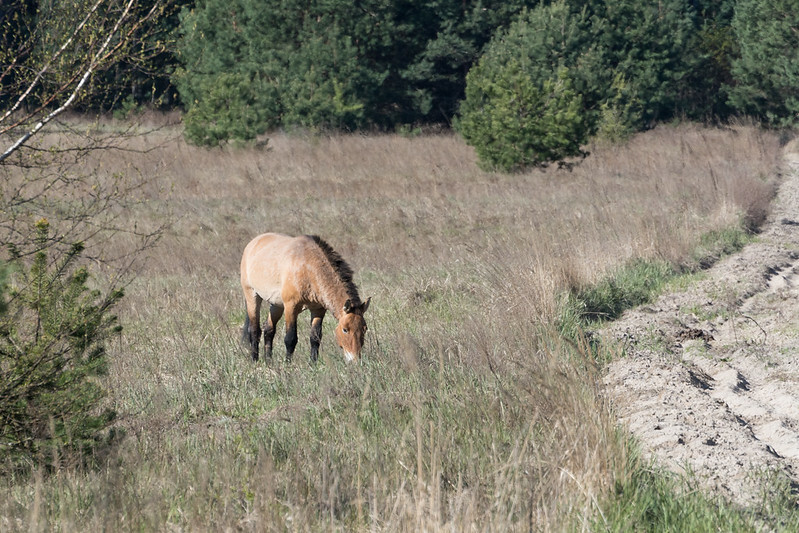 He had spotted one of the Przewalski wild horses that we had been looking for the previous afternoon. It was a long way away but I managed to get a few shaky photos. 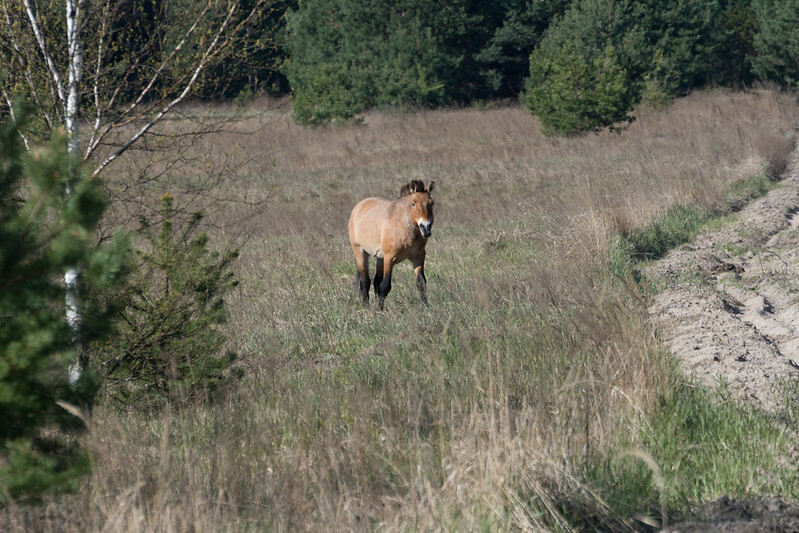 There are about a hundred of these animals in the exclusion zone. Normally they stay in small family groups. I am not sure why this one was alone. Maybe there were others that we couldn’t see? A few minutes later we arrived at the outskirts of the power station complex. 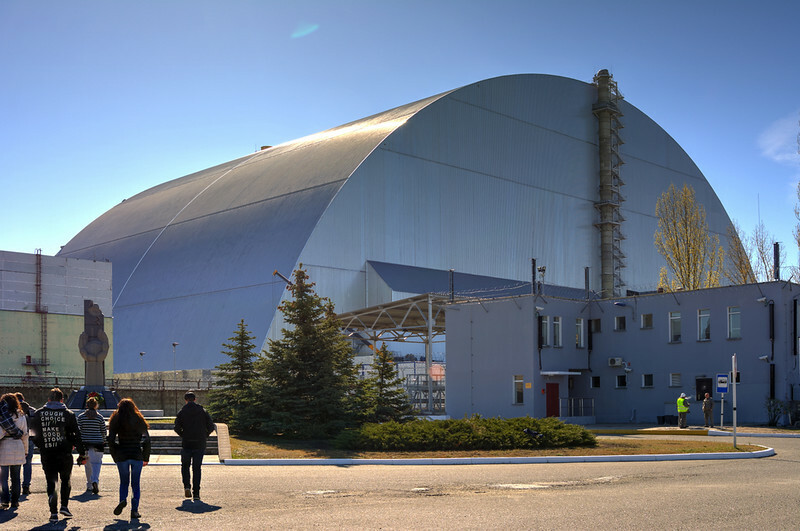 We got our first proper look at the sarcophagus or the “New Safe Confinement” that had been rolled into position a few months earlier. Radiation levels here next to the cooling water canals were about 1 micro sieverts per hour. Serhii had brought some bread with him from the hotel and we stopped to feed the fish. 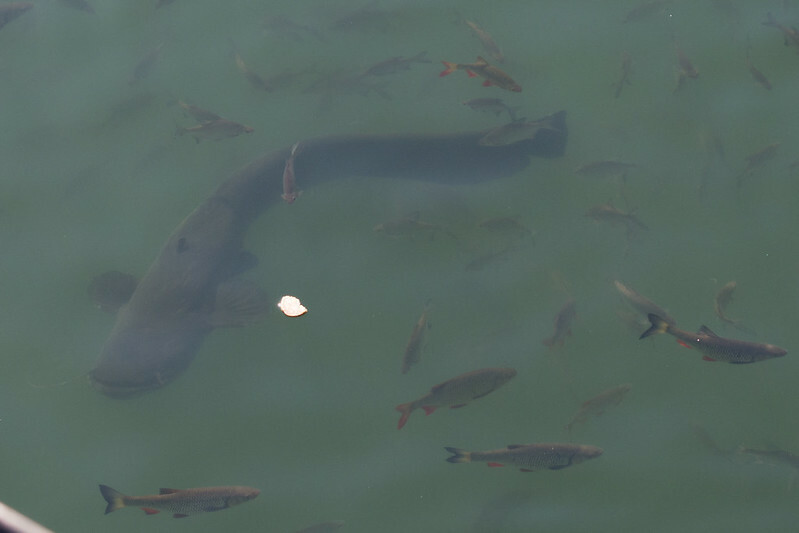 Take a look at this monster catfish cruising among the smaller fish. It must have been at least 2 meters in length from nose to tail! 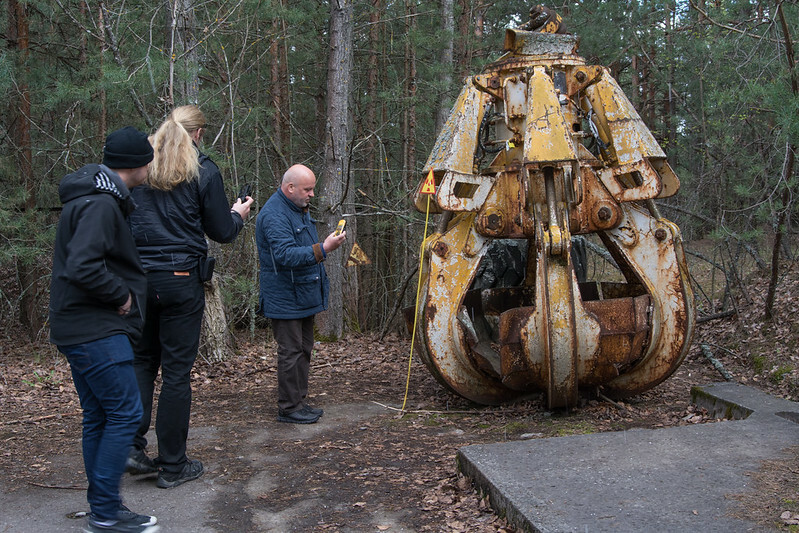 This is the closest we go to the remains of reactor number four. The new sarcophagus has been in position since November 2016 and is absolutely enormous! It is tall enough to fit over the statue of liberty, and (in the unlikely event that such a thing would be required) is wide enough to accommodate the Titanic sideways! Now it is getting really exciting. 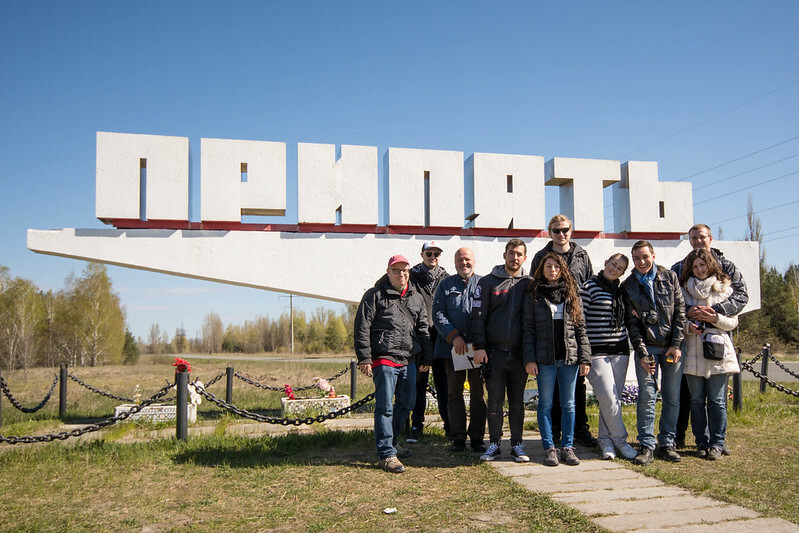 We have reached Pripyat – the model city built in 1970 as a home for the power station workers and their families. We stop for the obligatory photo at the sign at the entrance to the town and, as we are getting back in the minibus, are joined by a rather scruffy looking fox. 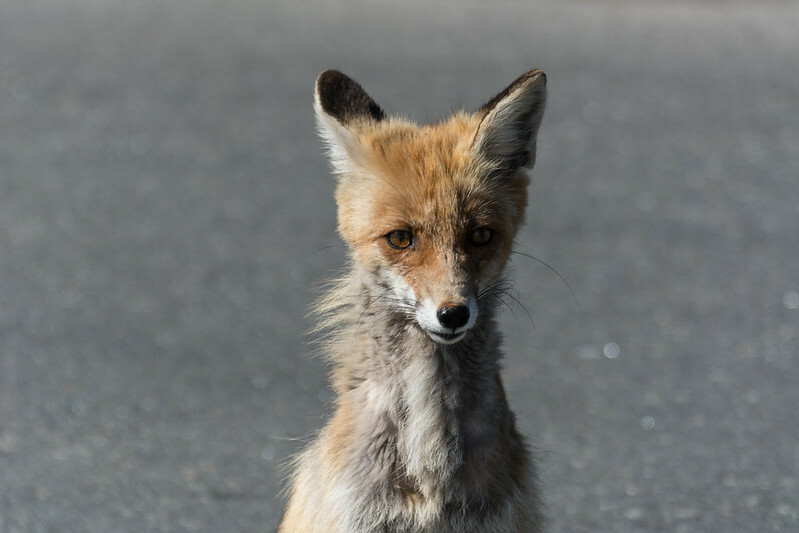 I think it has got mange but I am not sure. 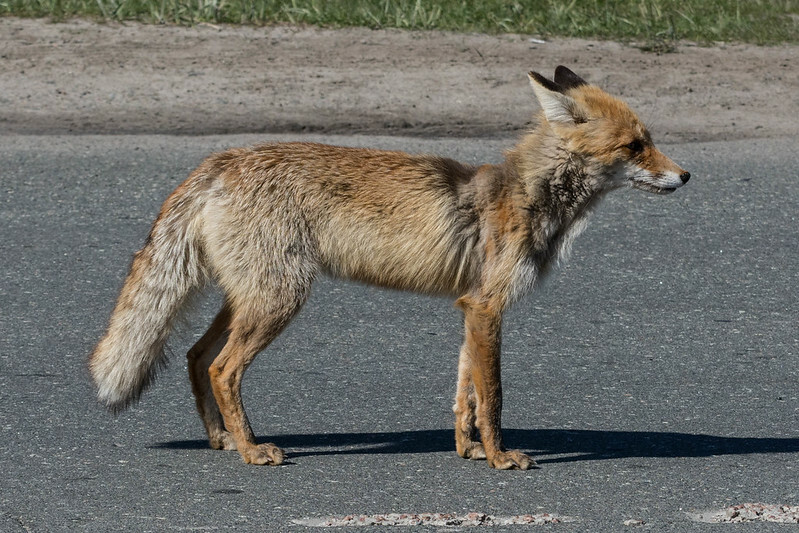 I wish I had had the presence of mind to get my geiger counter out to take a reading from it’s fur (it really did get very close). We were going to tour the city on foot so after passing through the checkpoint, our driver dropped us off outside Hospital number 126. This hospital received the first casualties from the explosion. Their clothes, massively contaminated, are still in the basement of the building which (needless to say) is strictly out of bounds. 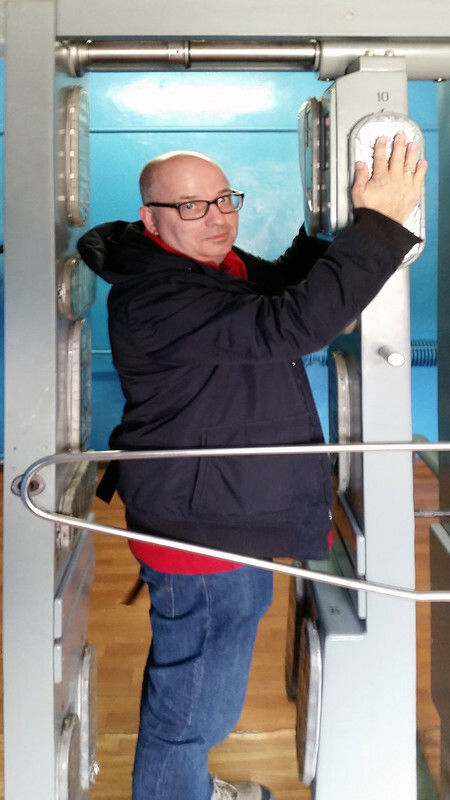 We had a few minutes to explore the outside of the building which seems to have been turned into a playground for recreational gynecologists. What is this chair, complete with stirrups, doing here? 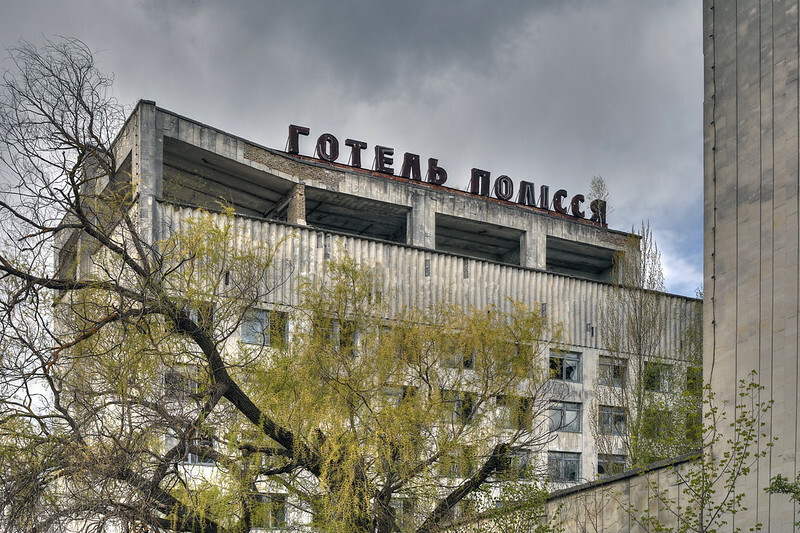 Access to all of the buildings in Pripyat is prohibited by the authorities., not because of the contamination, but because many of them are in very poor structural condition. 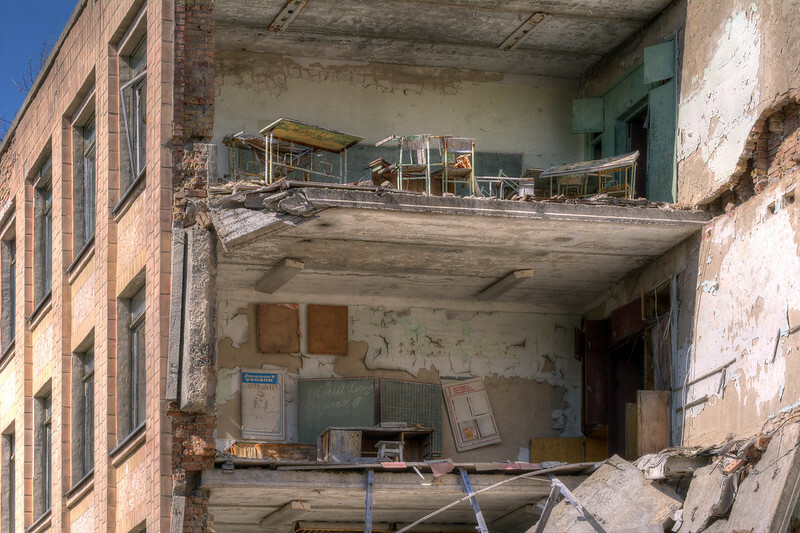 A good example is Elementary School Number 1 which has partially collapsed, leaving classrooms exposed to the elements. 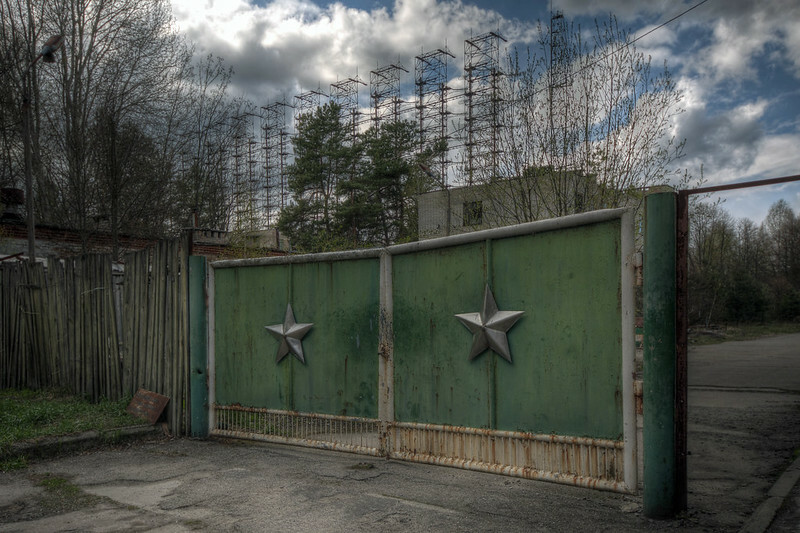 I was very tempted to go inside some of the buildings to take photographs but, the prospect of ending my days under hundreds of tons of soviet era masonry persuaded me that this was probably not one of my best ideas. 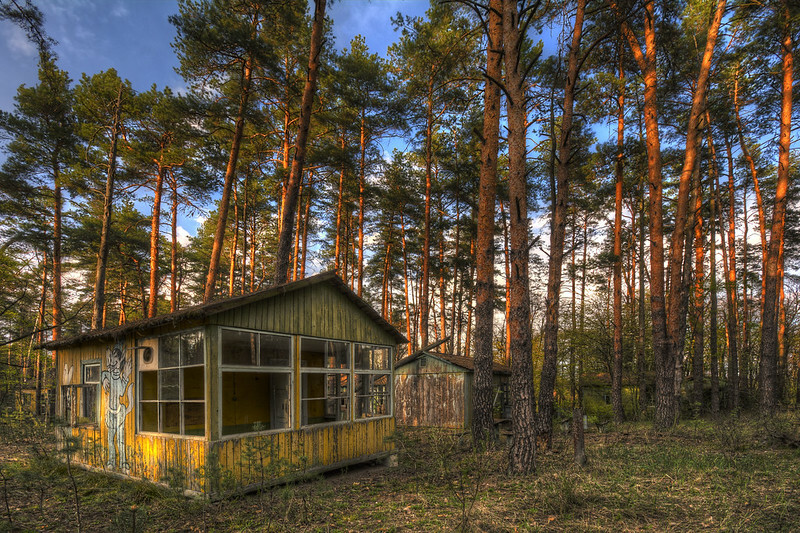 The city of Pripyat was only established in 1970 so it would have still been shiny and new at the time of it’s evacuation. The residents would have thought themselves fortunate to be living and working in this model city with all of it’s amenities. 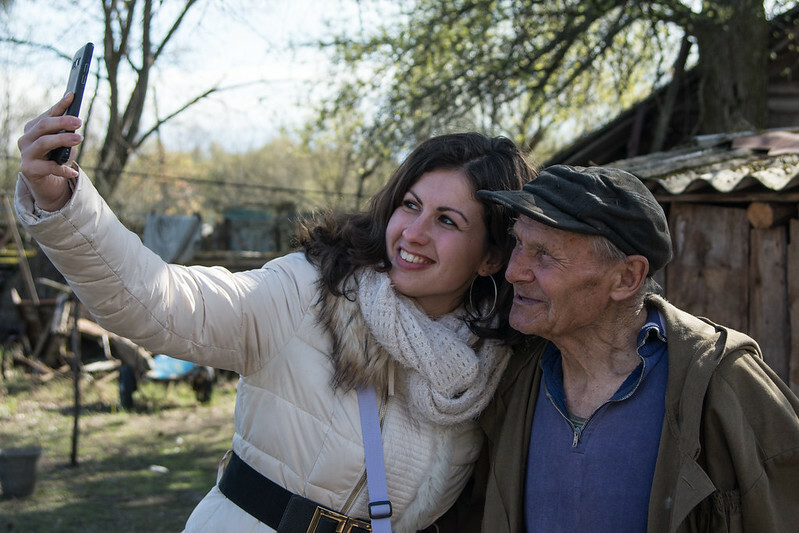 Serhii had lots of photos on his phone from before 1986 and, at many of the landmarks we were able to use them to compare the urban landscape then and now. Actually nowadays it is difficult to see many of the buildings due to the trees and shrubs that fill the spaces between them. I imagine that in the summer when the foliage is much denser, it is even more difficult. From a photographic point of view, it would have been interesting to be here 5 – 10 years after the disaster. From a radiological point of view, now is definitely preferable! 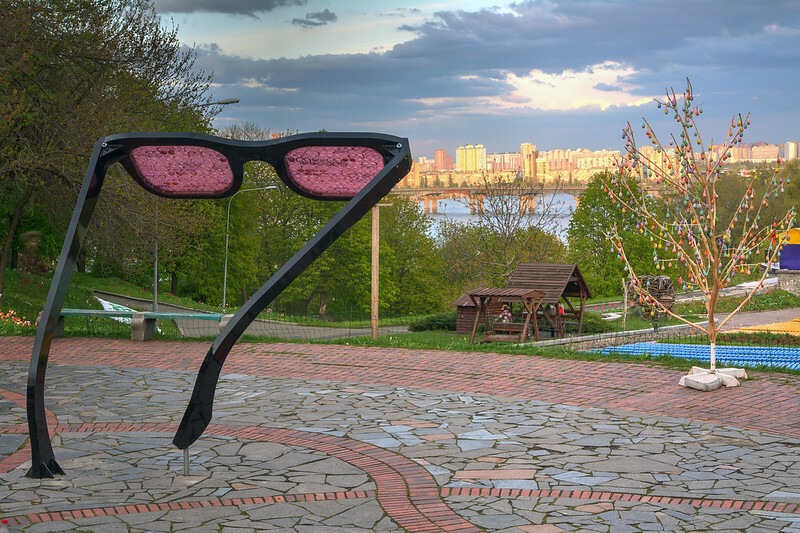 Cafe Pripyat is a large glass fronted building close to the river port. There is an area close to the terrace steps that registered 5 micro Sieverts per hour on my machine as I passed. At the river port we had the opportunity to photograph, and to actually board a large partially sunken pleasure boat. I have seen old photographs of this boat before the disaster, crowded with happy Pripyat residents enjoying some down time on the river. From the cafe, our route took us through the heart of the city, past the Promethius cinema, to the main square. Serhii gave us 15 minutes or so to explore on the strict understanding that we stayed out of the buildings. 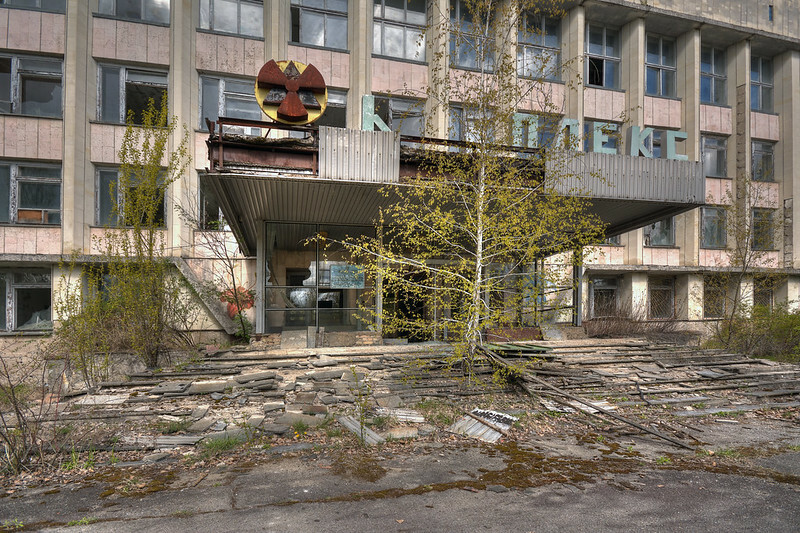 This is the derelict shell of the City Administration Offices, complete with the nuclear power sign over the entrance reminding Pripyat’s residence that they were there to harness the power of the atom for the good of the Soviet Union. 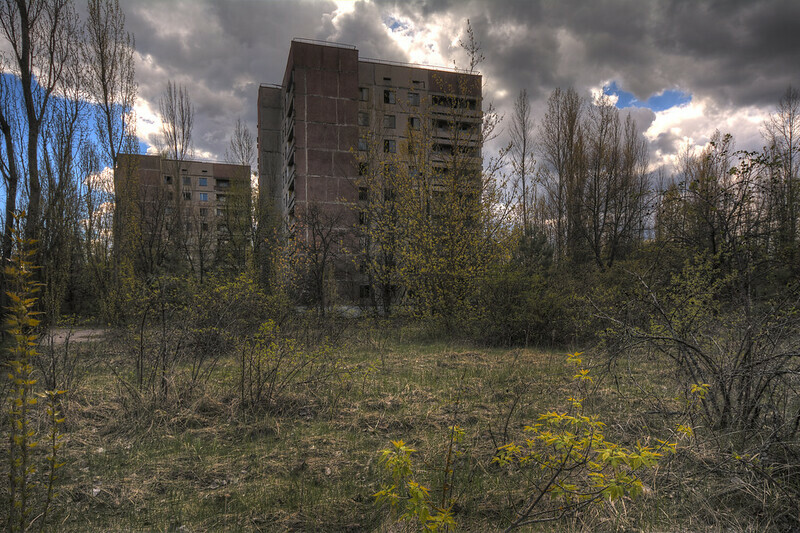 I worked my way across the square, past the Hotel Polissya, one of the tallest buildings in Pripyat and apparently one of the locations featured in “Call of Duty 4: Modern Warfare”, a video game that I do not have in my collection but is I am sure is familiar to my sons and their friends. 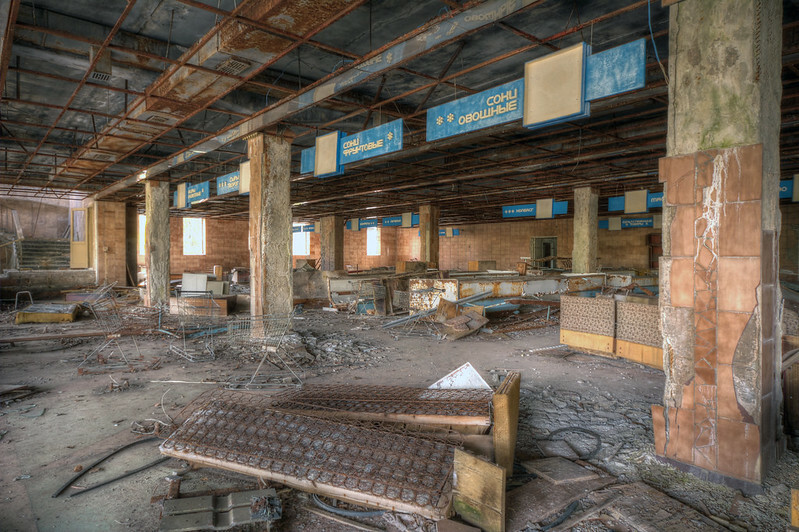 They probably made virtual visits to Pripyat long before I ever though of coming here. Bearing in mind the “no entering buildings rule”, the next couple of pictures may surprise you. Actually I only really poked my head (and tripod) through the doors. 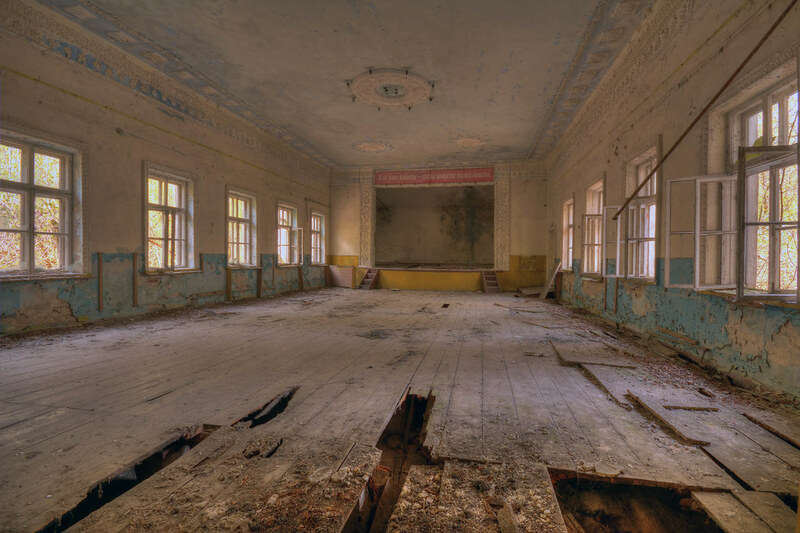 This is a room in the “Energetik” Palace of Culture that would have be the center of social life in Pripyat. It boasted a cinema, a ballroom, a gymnasium, music rooms and even a shooting range. Remember that Call of Duty wasn’t a thing back then so the good people of Pripyat had no option but to use real firearms! Across the square was a large supermarket. 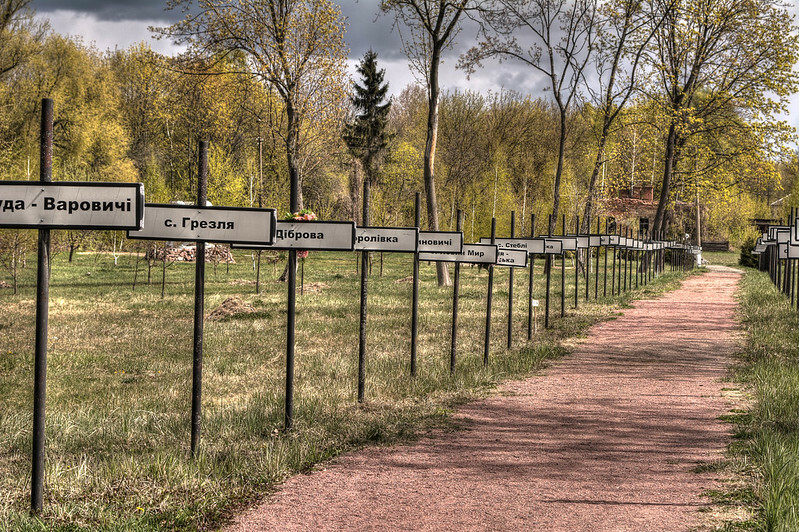 I managed to snap one or two pictures before Serhii rounded us up and took us to the part of Pripyat that everyone will recognise. 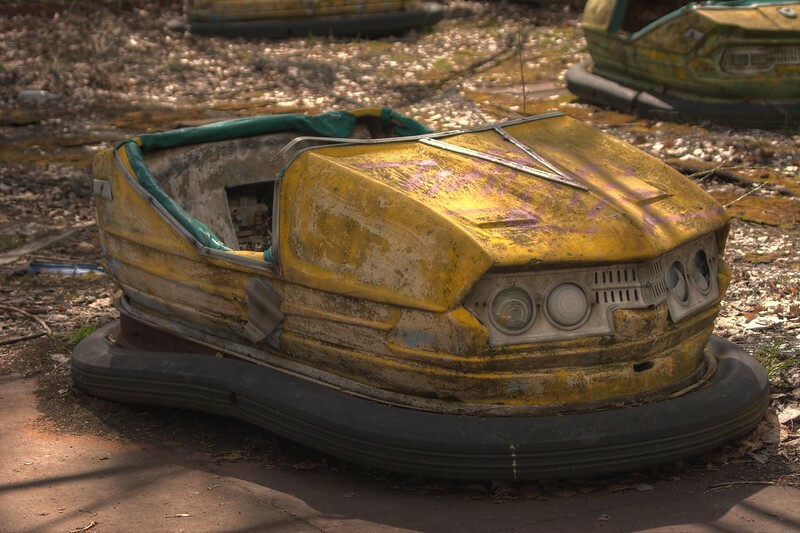 Over the years, the amusement park, complete with Ferris Wheel and Dodgems has become something of a icon for the city. 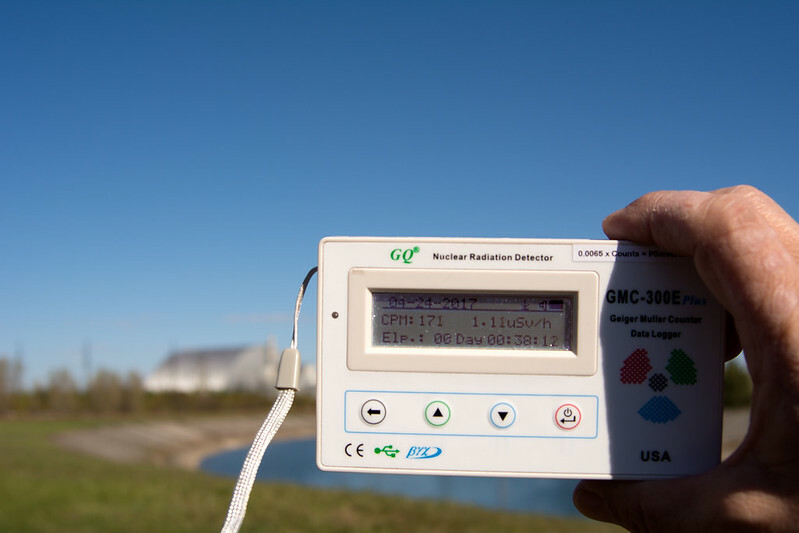 Radiation levels at 1-2 micro Sieverts per hour are a little higher than the surrounding area. The helicopters used to fight the graphite fires at the reactor would land here for decontamination (washing basically) between sorties. I would have liked to have a bit more time here but we had about thirty minutes to explore. It felt more like ten. The Avant Gard sport stadium is a short walk from the Amusement Park. The oval track is now extremely overgrown and unrecognizable but the grandstand is still there. While we exploring we were treated to a brief snow shower. 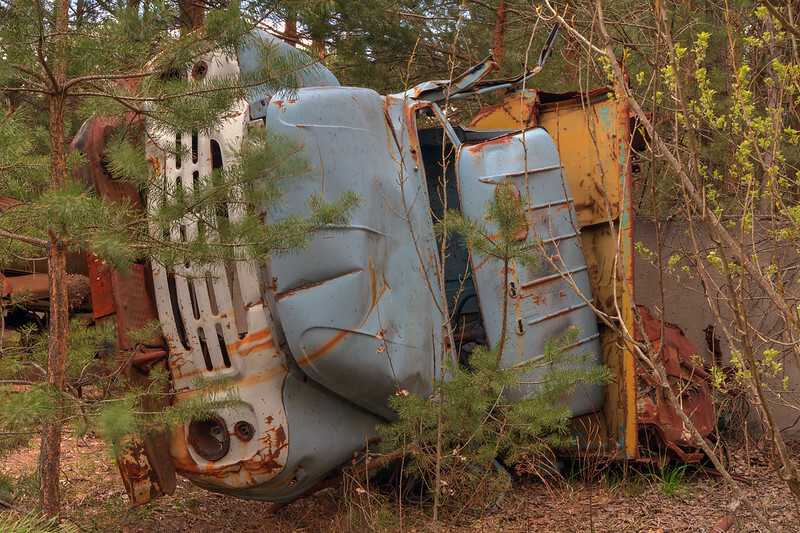 Some areas of Pripyat are out of bounds to tourists, including the highly radioactive (but extremely photogenic) vehicle graveyard where the helicopters and military vehicles are dumped. 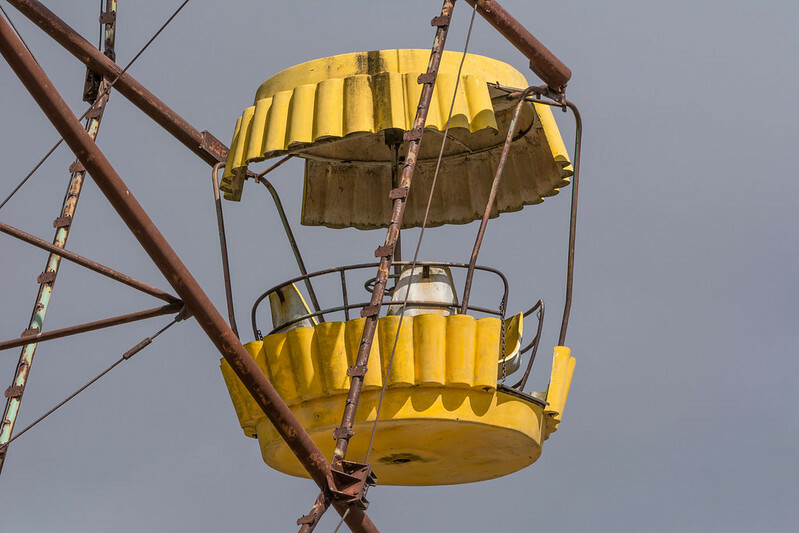 The most radioactive artifact that is easily accessible is this “claw” that was used during the decontamination operations. Some of my fellow explorers managed to get their dosimeter readings up to over 40 microsieverts per hour by approaching rather closer than I was comfortable with. My peak reading was a wimpish 8 micro Sieverts per hour. If you do some googling you will find reports of people getting readings of more than 300 from parts of the claw! 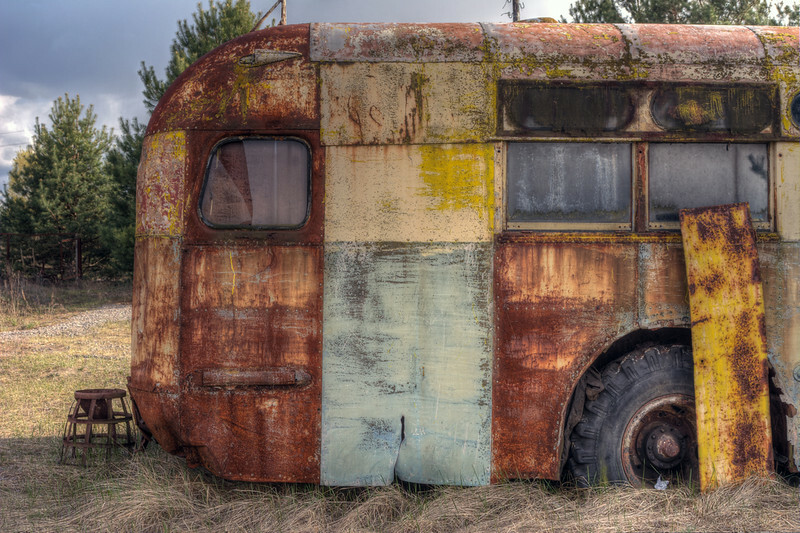 Our last stop in the city was a garage where scores of trucks and buses were slowly rusting away. I am a bit of an old car nut and this is the sort of thing I like to photograph. Again I would have liked to spend a bit more time here but it was already early afternoon and we still had several other things on our itinerary. 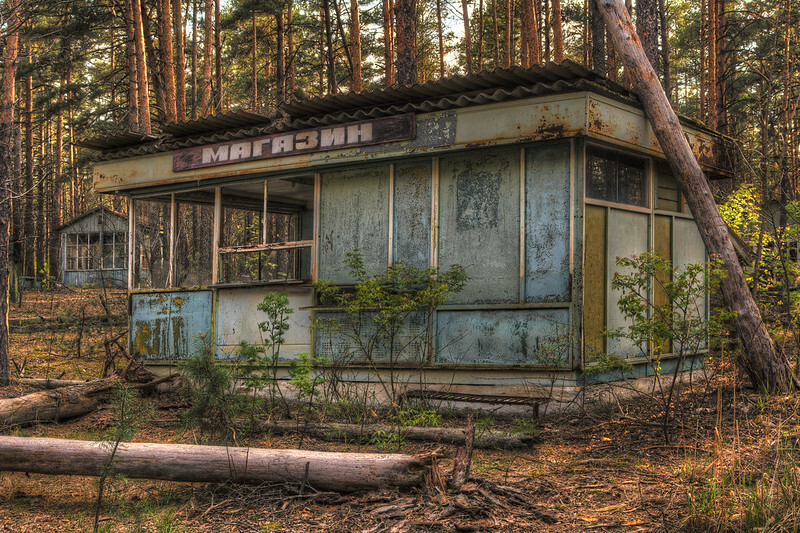 We left Pripyat passing (rapidly) through the Red Forest, an area of woodland that was so contaminated by the disaster that the foliage was heavily discoloured. The trees were all cut down and buried during the “liquidation” efforts but the radiation levels here are still high today. My dosimeter registered 7.2 microsieverts per hour. Our driver needed no encouragement from us to put his foot down as we passed through the area. 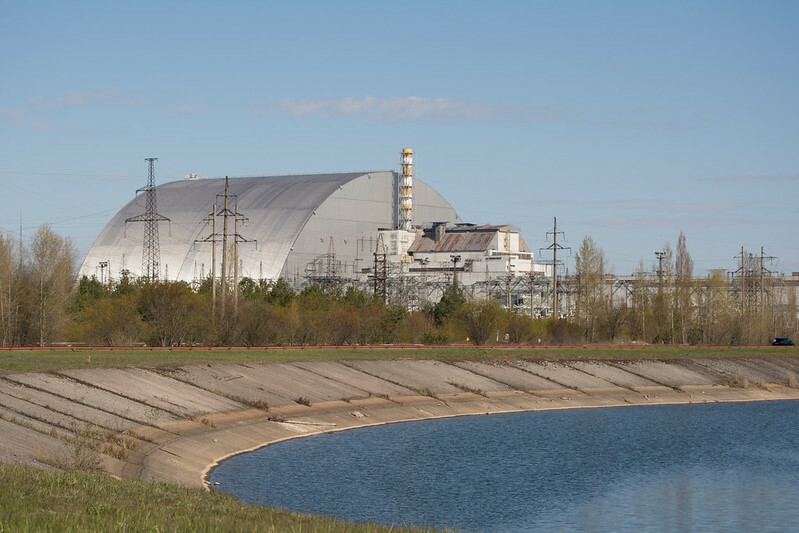 When the four reactors on the Chernobyl site were in operation, they required vast quantities of cooling water from the artificial lake adjacent to the site. 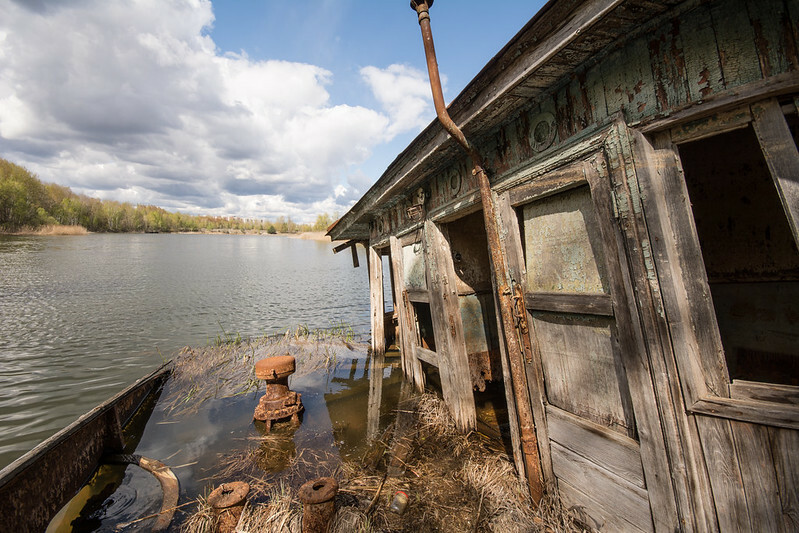 So much heat was transferred to the water that the lake had an all year round temperature of about 25 Celsius, even during the long cold Ukranian winters! 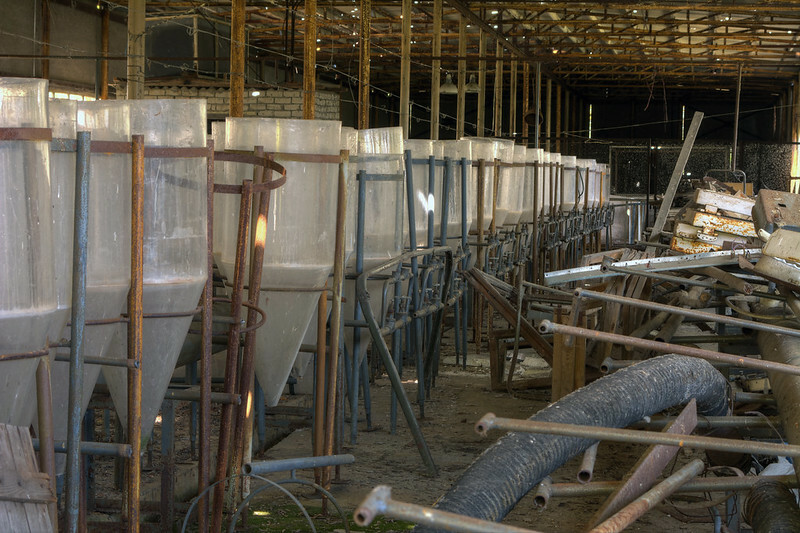 An experimental fish farm was established with a large hatchery and a research building. We had 20 mins to look around and it was really rather photogenic. 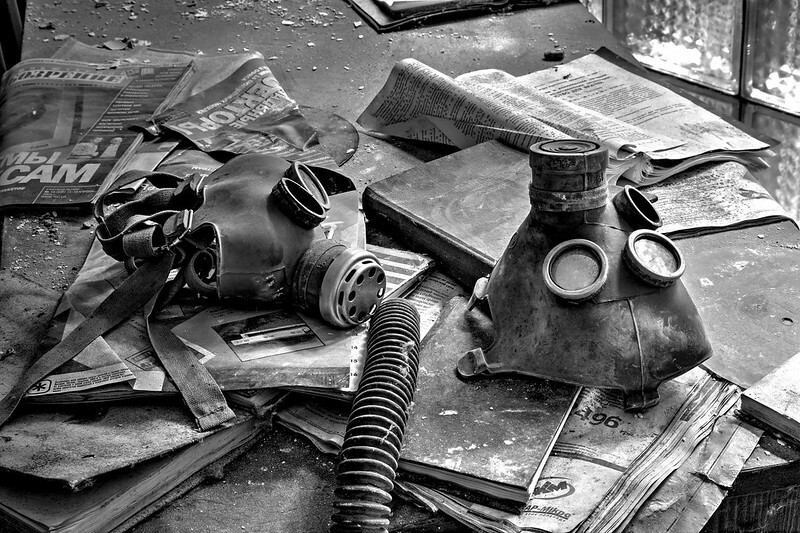 I am suspicious though about the authenticity of the artifacts we found on the site, particularly the gas masks and the Russian publications strewn around the floor. 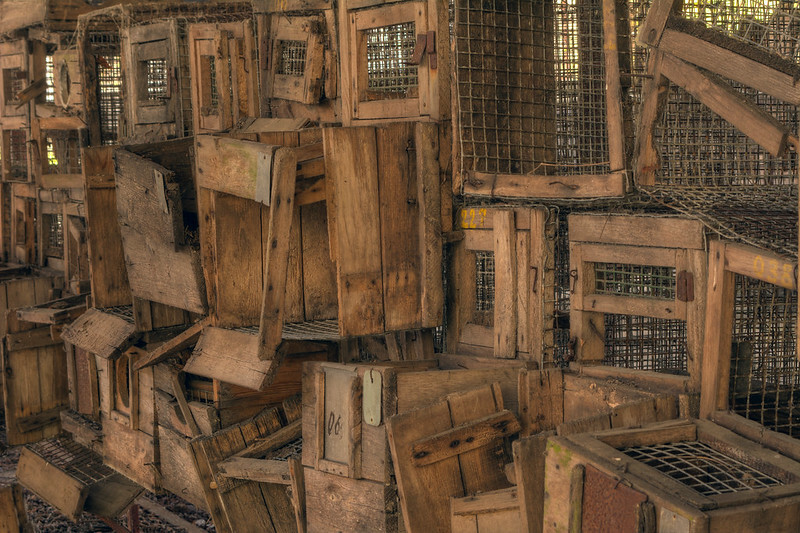 Behind the fish farm is a long shed filled with rickety wooden cages that were once used to breed mink! 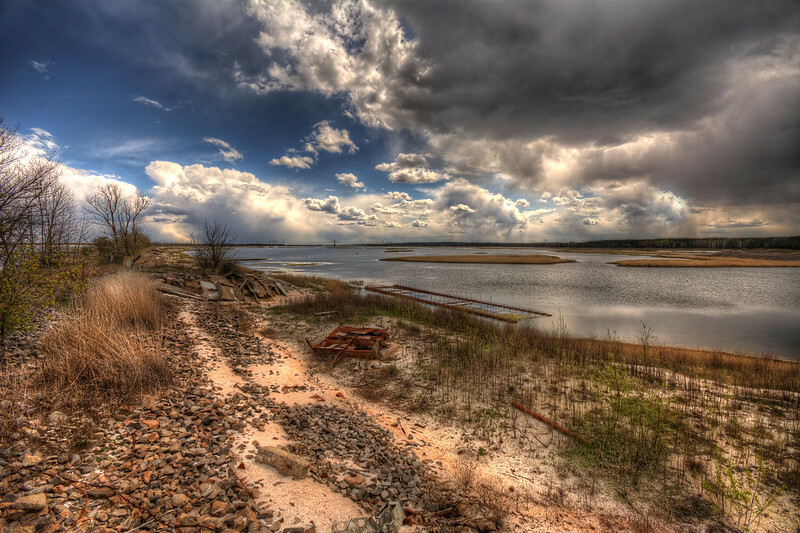 The level of the cooling lake is falling and there are debates in the Ukraine about what to do with this site. The main worry is that the lake will dry up, exposing the radioactive sediment at the bottom. One option is to concrete over the lake and install rows upon rows of solar panels – also nuclear power of course but this time with the reactor located at a safe distance of 93 million miles away! 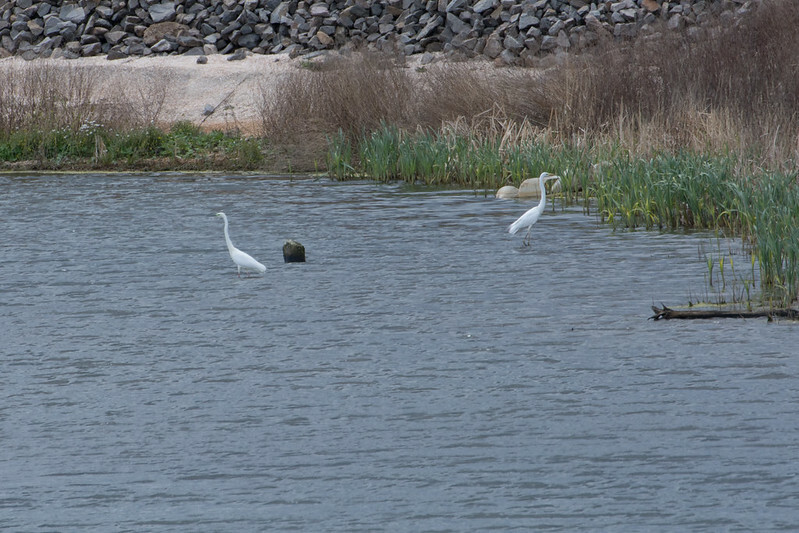 There were Great White Egrets on the lake when we visited – thanks to my bird-watching colleague Ian for the identification. I had them down as swans! It was now mid afternoon and we had one more stop to make before our tour was over. We drove east to within a few kilometers of the border with Belarus before turning down a track to the village of Paryshiv. 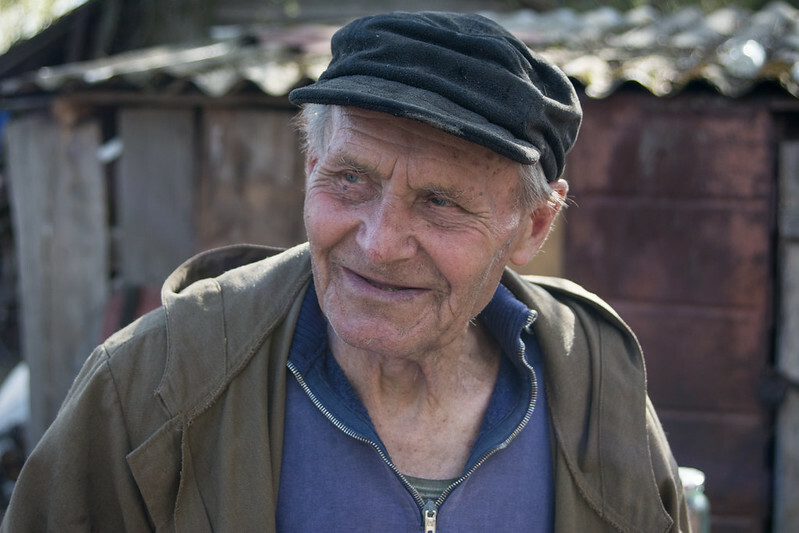 Here we were hoping to meet Ivan, a self-settler who had been evacuated from his home in 1986 but had returned a couple of years later to his smallholding where he has lived ever since. I wasn’t sure how Ivan might react to visitors just turning up at his house unannounced but I guess that he has some sort of arrangement with the tour companies. When we arrived, Serhii asked us to stay in the bus until he had determined whether Ivan was in the mood to receive visitors. Fortunately he was, and we all trooped into his garden where he told us a little bit about how he lived. We learned that he had 11 chickens. We also learned that his wife Maria had died the previous year leaving him and three other women (who’s company he did not care for) as the last remaining inhabitants of Paryshiv. Ivan’s current concern was the damage that beavers were doing to his fish pond. They had recently dug a channel from a nearby stream and turned his pristine carp pond into a swamp. He was furious about it and Serhii’s had to work hard to filter a stream of beaver related expletives when translating Ivan’s account of the saga. 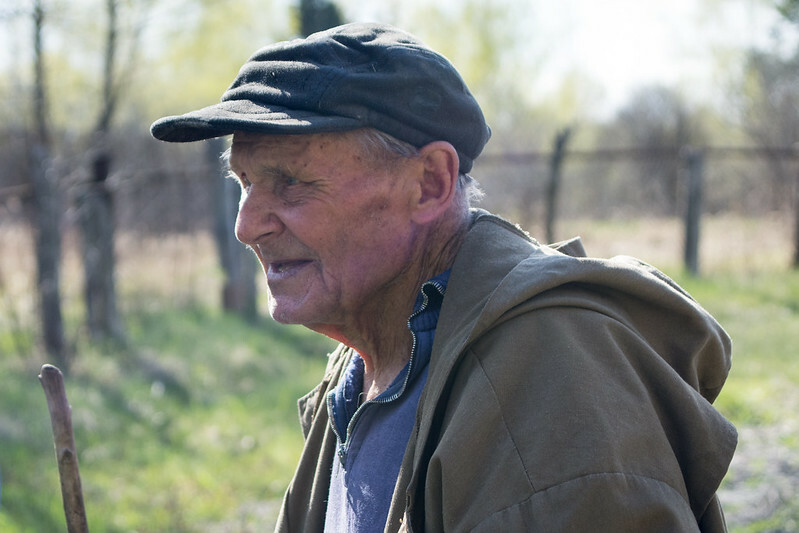 Being 82 years old, Ivan no longer drives, even on the empty roads in the exclusion zone. 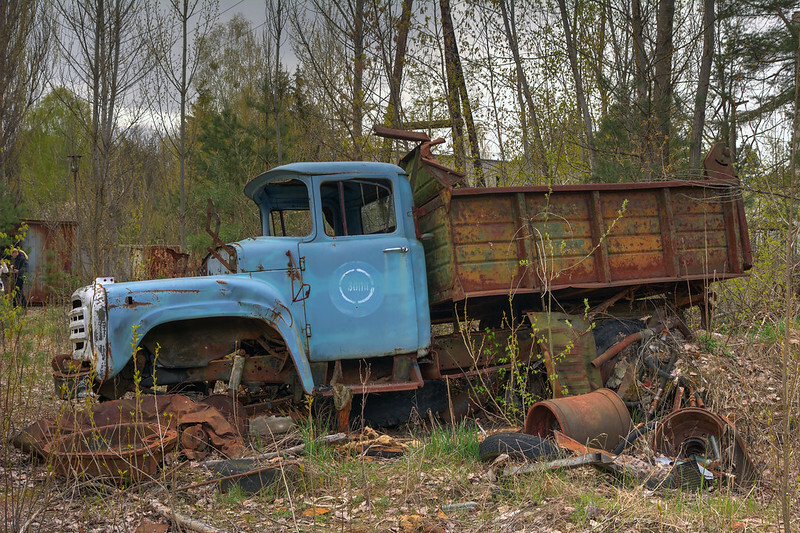 He does still have a car – a Soviet era Saporoshev 968 but it had obviously not moved in a long time. Towards the end of our visit a television crew appeared. Ivan seemed to have been expecting them and they waited patiently until we were done with him. Before we left they filmed one of our group taking a selfie with him. We left the exclusion zone at about 16:30 having completed our paperwork and being pronounced clean at the final radiation checkpoint. 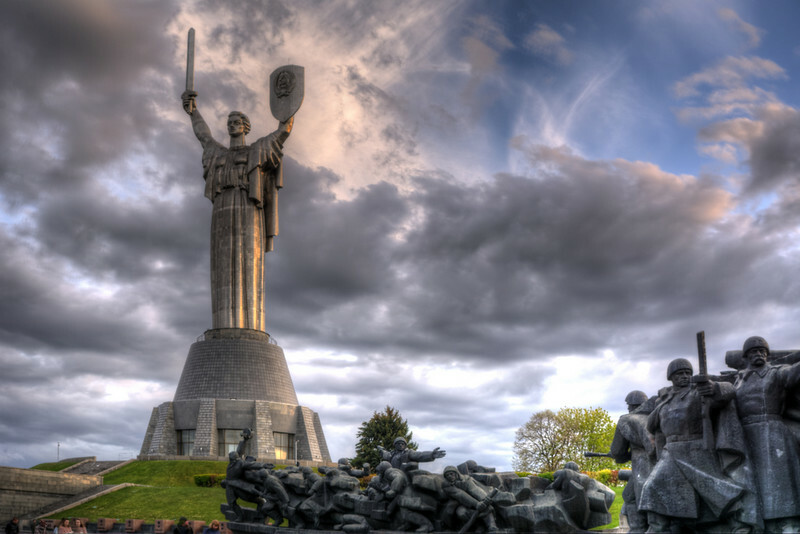 Our driver pointed the minibus towards Kiev and turned on the radio just as (I am not making this up) Imagine Dragons struck up with their 2012 hit….. Some of the younger members of our group knew the words and couldn’t resist singing along! 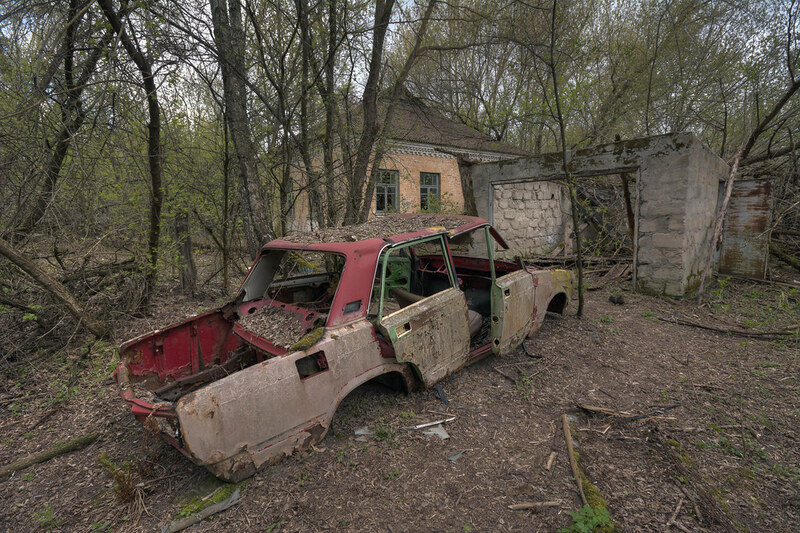 If you are tempted to visit the Chernobyl exclusion zone yourself, please remember that you can’t just rent a car and turn up. You need to book with an approved tour operator and provide your name and passport details well in advance of your visit. 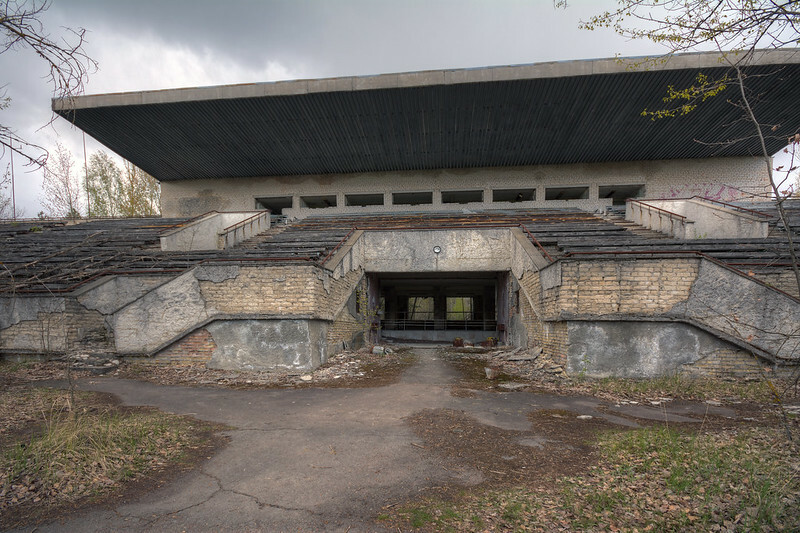 I booked a two day tour with Chernobylwel.com (https://www.chernobylwel.com/) and have no hesitation in recommending them. 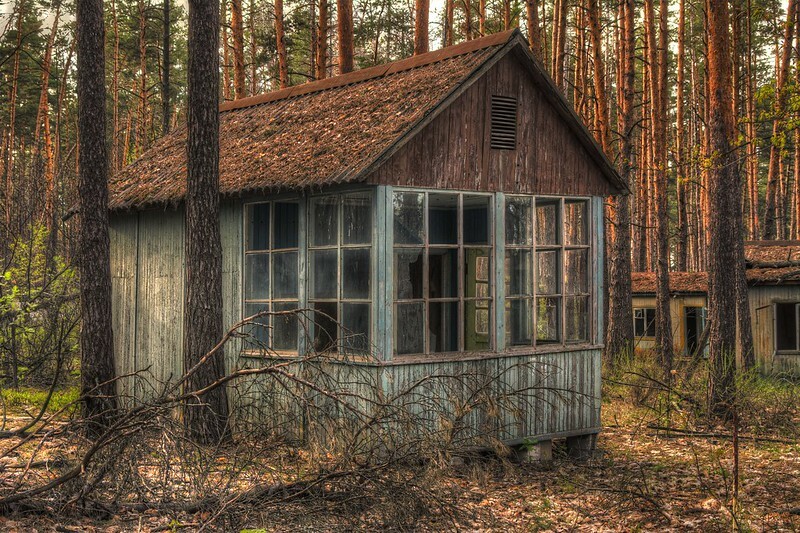 The massive scale of the radioactive contamination in the Chernobyl exclusion zone is well known. 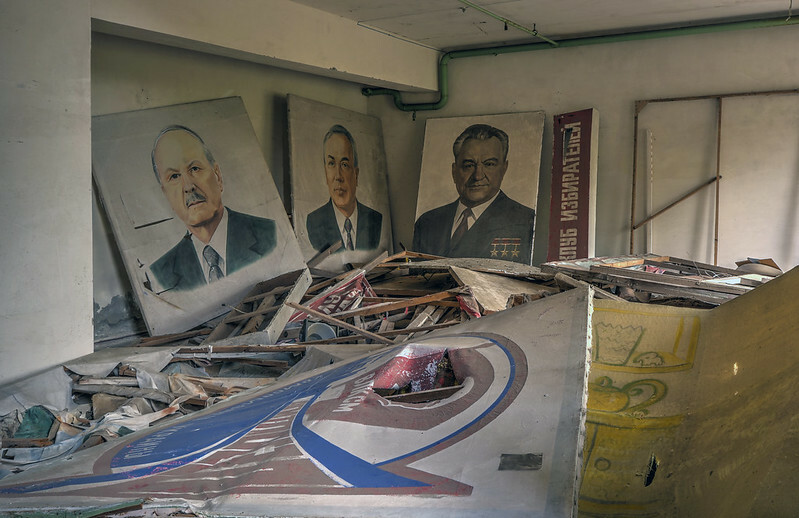 The efforts to decontaminate the area was also massive with the then Soviet Union sending in 600000 human “liquidators, many of them conscripts, to deal with the mess. 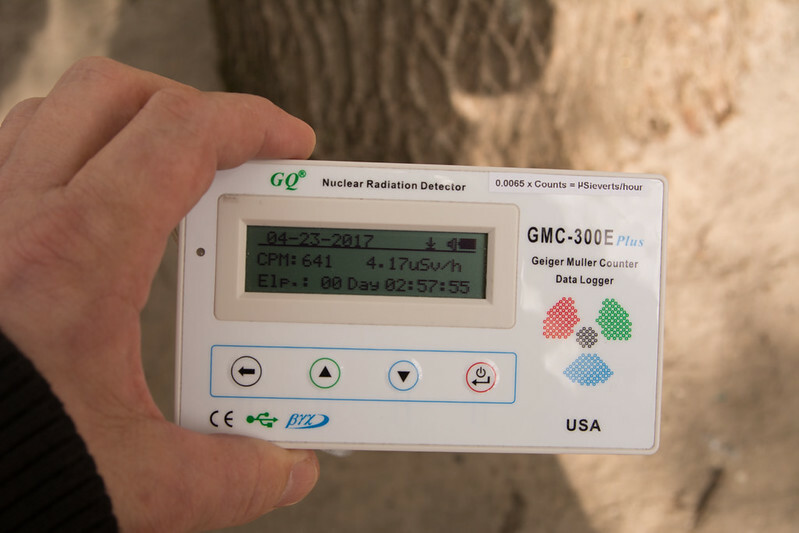 I took a Geiger-Muller counter with me on my trip and logged the radiation levels at all of the locations I visited. The top graph was during my flight from the south of Germany to Kiev. At a height of 37000 feet, we were exposed to a little over 2 micro Sieverts per hour for about 2 hours so, assuming the same levels on the way back, my flights “cost me” 8 micro Sieverts. 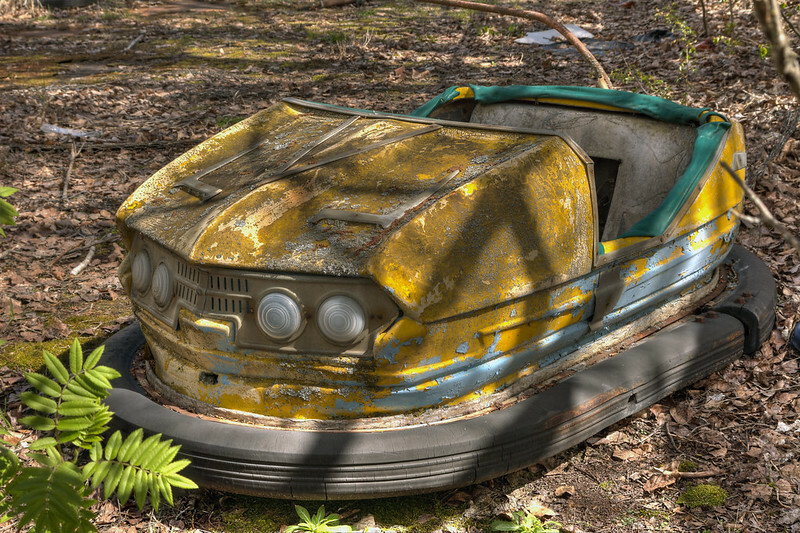 By comparison, the hour I spent in the Childrens Summer Camp – one of the more radioactive areas in the zone, subjected me to about 1 micro Sievert (still about ten times what I would have got if I had stayed at home). Click on the graph to see it bigger in Flickr. 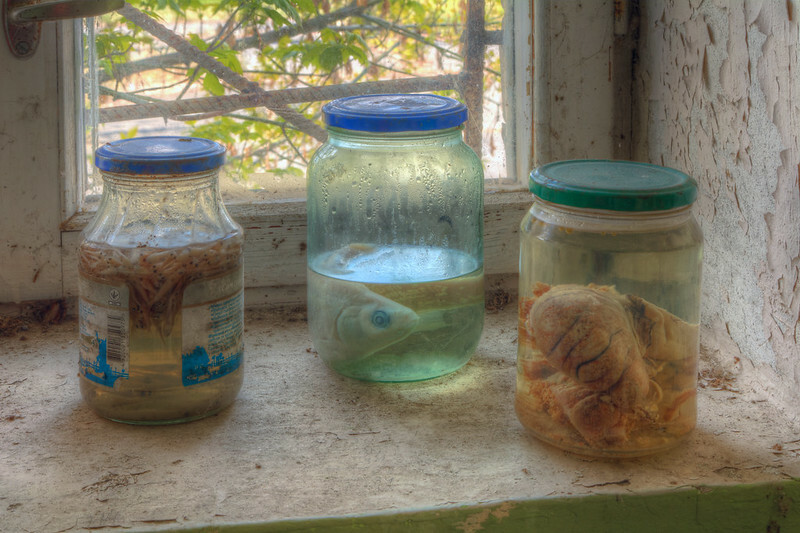 If you plan a visit to Chernobyl then the chances are that you will spend some time in Kiev. I only had a few hours to explore and I wished that I had booked an extra day. I walked to the Motherhood monument and got there just as the sun was setting. I got some great pictures. 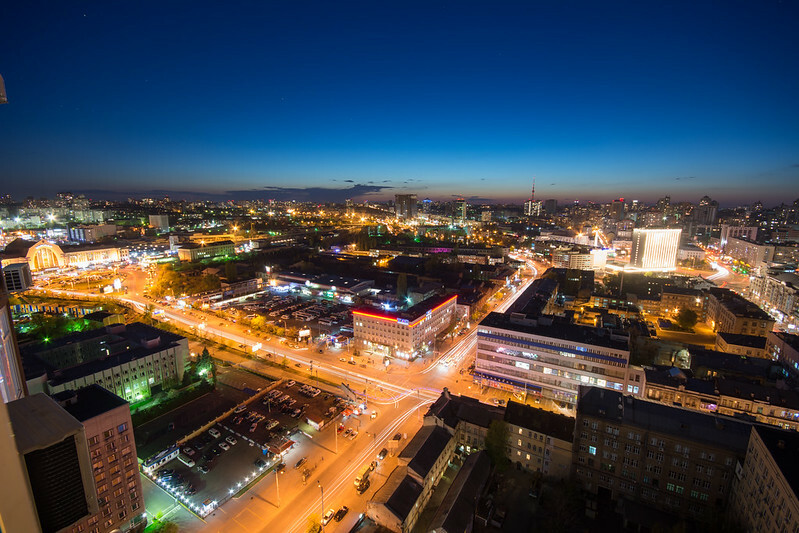 On the last day of my stay, this is what downtown Kiev looked like from my 26th floor hotel window…..
As I left Kiev, the city was gearing up to host the 62nd Eurovision song contest. Definitely time to leave I thought….. Excellent post James, I feel like I’ve been there myself now! Wonderful chronology and expose of your trip. Great job James! Thanks you for sharing James, I hope to visit one day. Amazing story through pictures. Great pictures and a well-told story story about your trip.